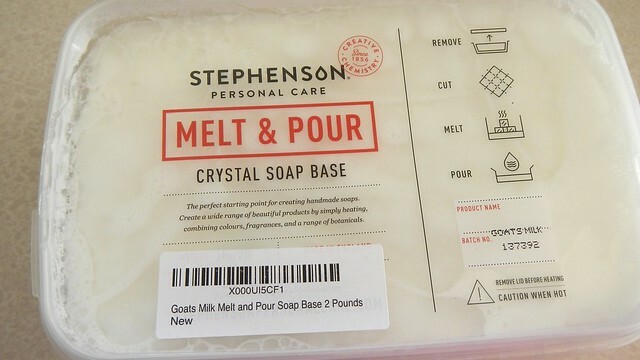 After my disastrous start with melt-and-pour soap, I’ve been leery of trying it again. 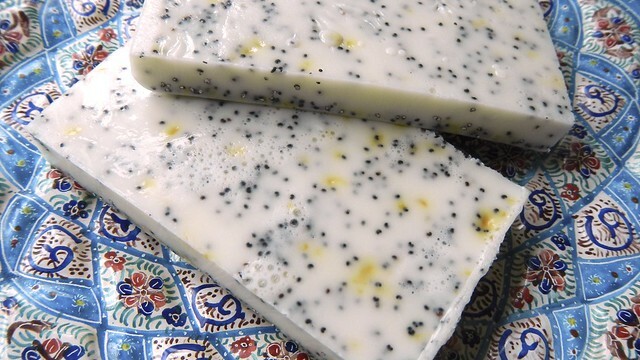 It was way more of an accomplishment for me to learn how to make soap entirely from scratch, though nobody will let me near the chemicals these days. 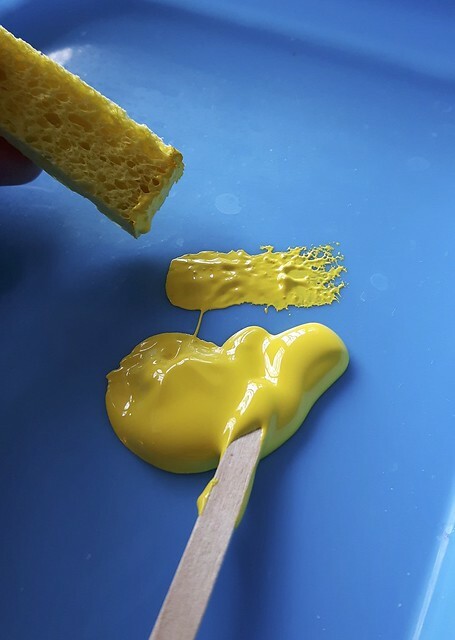 And with melt-and-pour soaps, you already know the chemical reaction is going to work, so newbies like me have much more freedom to experiment with the add-in ingredients. And this mixture from A Beautiful Mess has been haunting me for ages with its deliciousness. I had to do it. 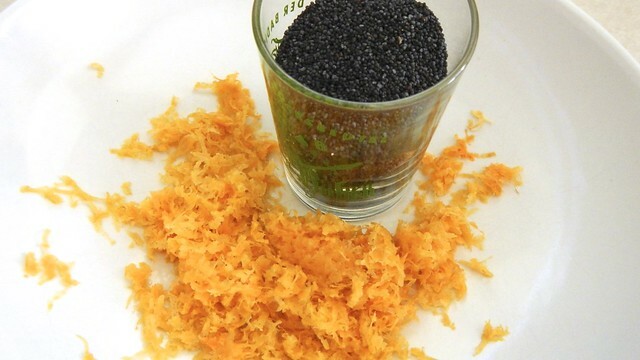 The simplicity of the ingredients is a definite bonus, and the fact that it’s so quick and easy to put together and then you can ignore it for a while is also a plus. 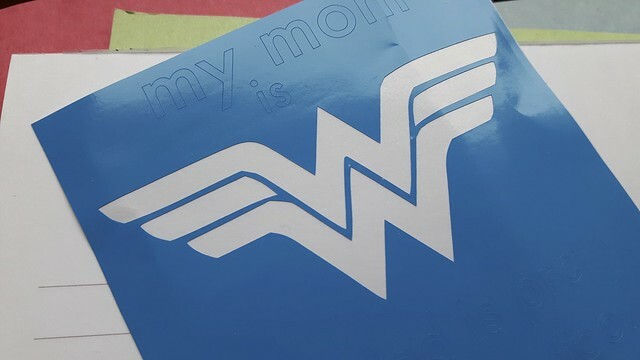 I made this while painting two sets of lawn furniture so obviously my attention was divided. 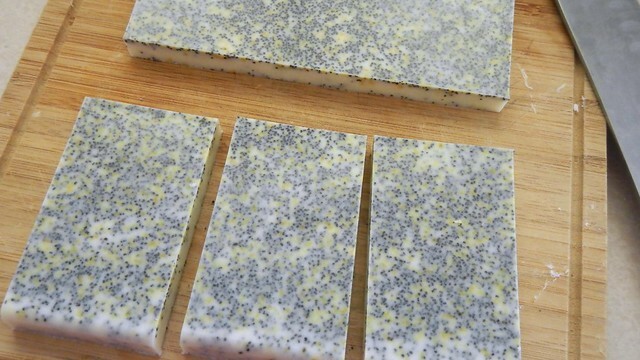 All you need is 1 grapefruit, 3 tablespoons poppy seeds, peppermint essential oil, grapefruit essential oil, and 2lb goat’s milk melt-and-pour soap base (which you can buy in craft stores and from Amazon). 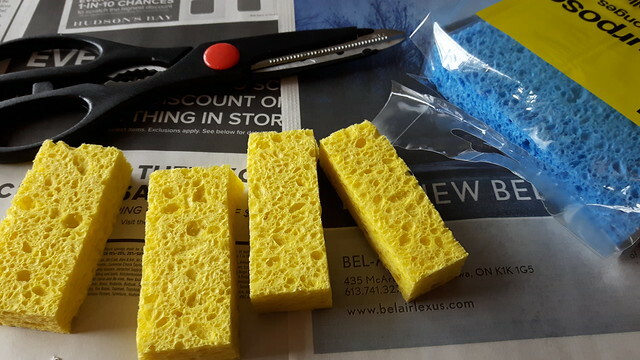 You also need something to pour your soap into to harden – I used the silicone trays I bought for making my jelly fish mobile. 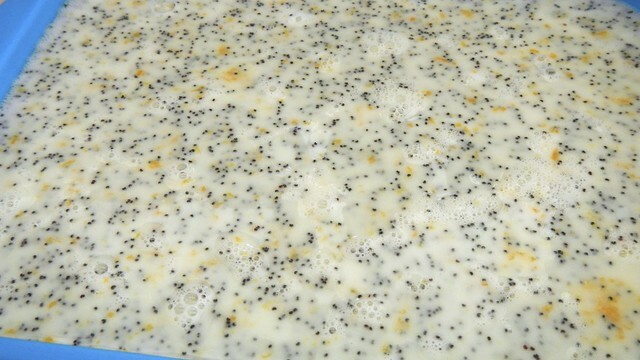 Grab your soap base. Apparently you can melt it in the container provided in your microwave but I decided that was unwise. 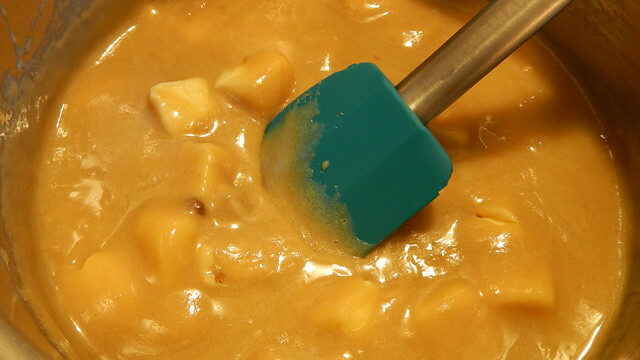 Plop those cubes in the top of a double-boiler and let that sucker melt for a while. You’ll find a skin develops as it melts. Just stir that back in. 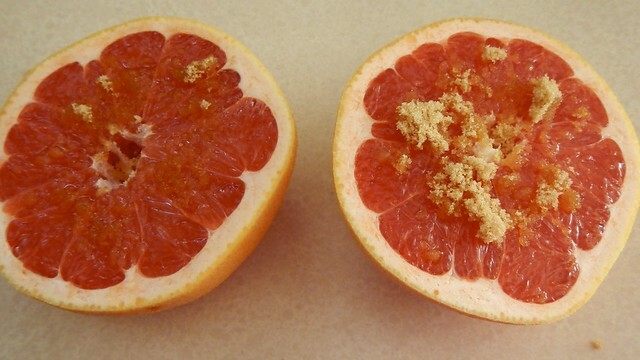 While that’s a-meltin’, go ahead and zest the entire grapefruit. 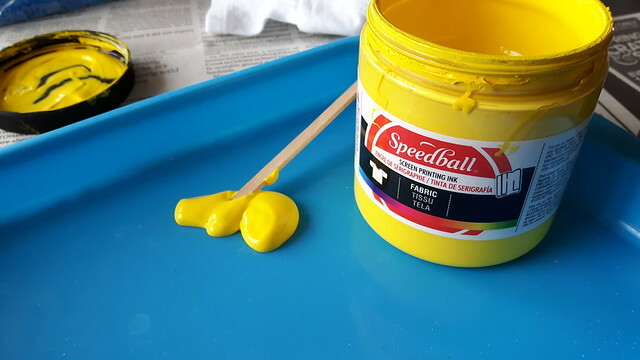 Mmm, lovely. Then eat your grapefruit. It’s good for you. 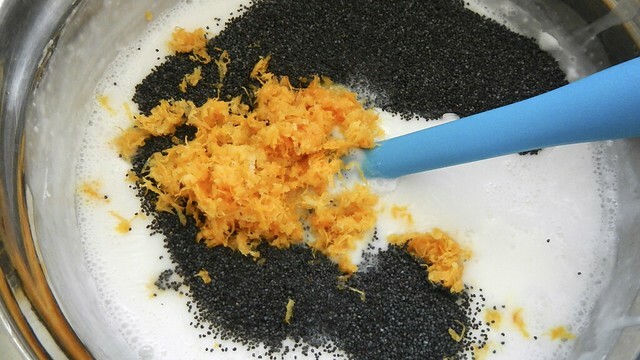 Gather your poppy seeds as well, about 3 tablespoons. 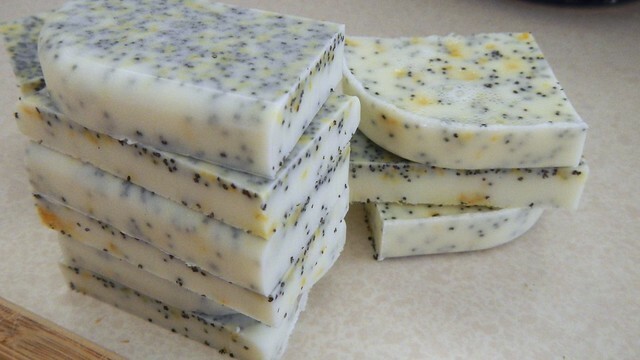 Once the soap has fully melted, remove it from the heat and tip in your grapefruit zest and poppy seeds. Shake in about 12 drops peppermint essential oil, and about 30 drops grapefruit essential oil, and stir that in quite well. 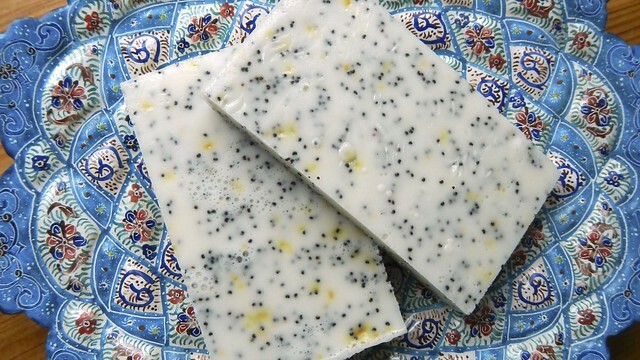 Pour the melted soap into your moulds to harden. 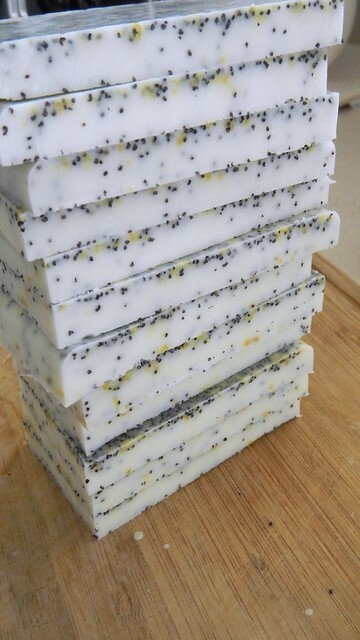 You can use individual moulds if you like but mine was a big block rectangle – the soap is soft enough to cut afterwards so you can chop the soap bars down to size when they’re ready. I chopped it up into regular rectangles. The rounded corner bits I re-melted and poured into the same mould but with the corners blocked off so they had sharper edges. 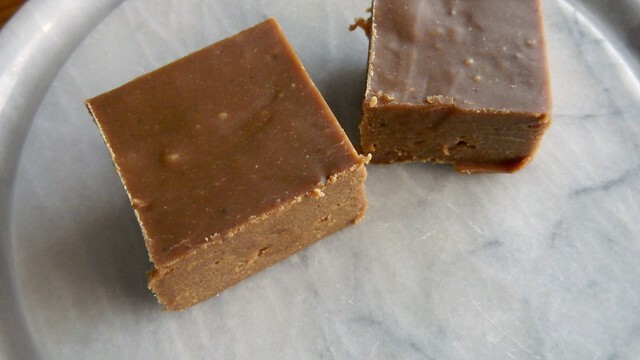 This recipe from Real Simple is not your typical fudge, but it’s relatively easy to concoct and would make a nice gift to your favourite coffeephile. 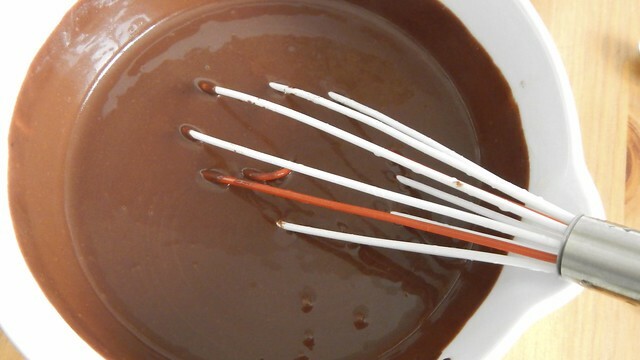 You don’t even need a candy thermometer to make it, which is handy for those of you who aren’t familiar with making candy. Do keep a close eye on it, however, as I burnt the bottom of one of my pots quite badly the first time I made it. 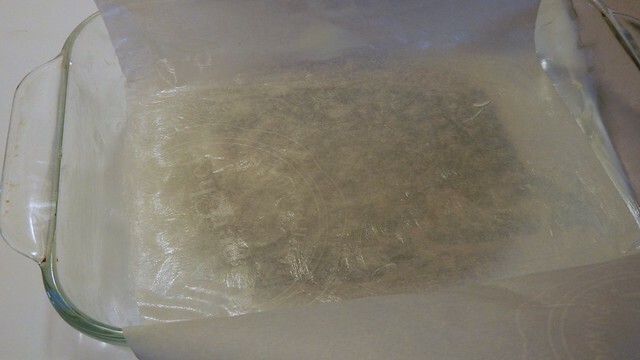 Start by lining an 8″ square pan with parchment paper and spraying it with cooking spray. 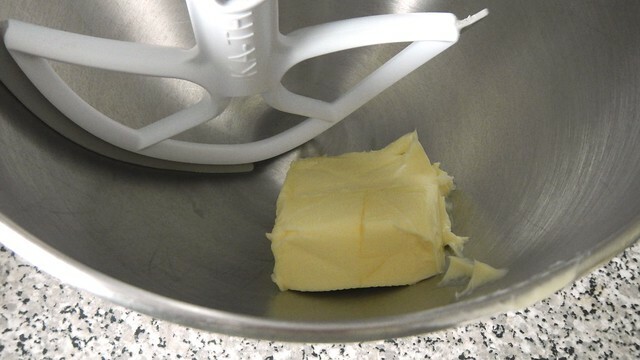 I had neither a square pan nor cooking spray at the time so I used this 6″ x 10″ pan and I buttered it instead. 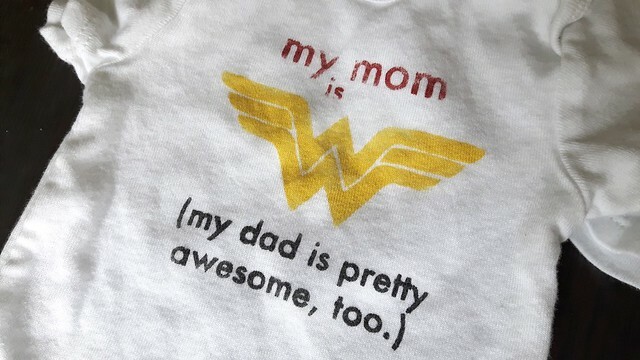 You do you. 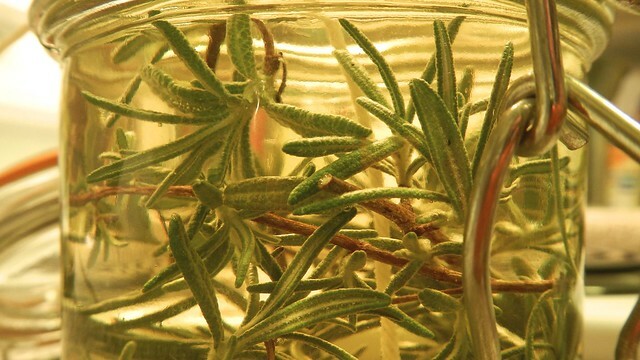 Set that aside for a spell and grab a large pot. 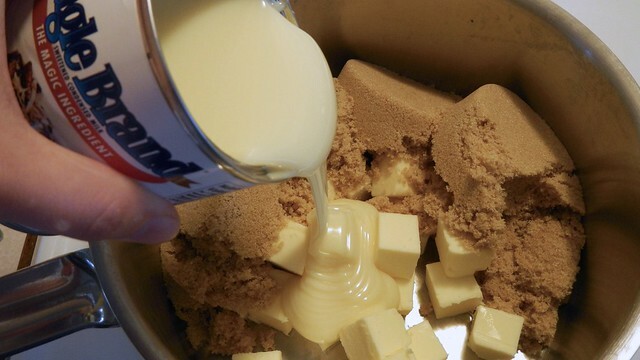 Dump in 1/2-lb butter, 2 cups brown sugar, and 1 14-oz can sweetened condensed milk. 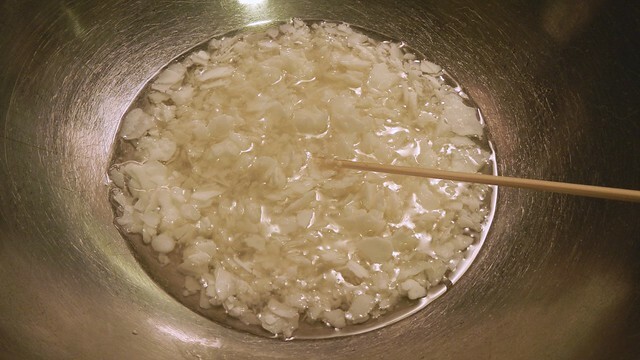 Stir that frequently over medium-low heat until it’s all melted and starts to boil. 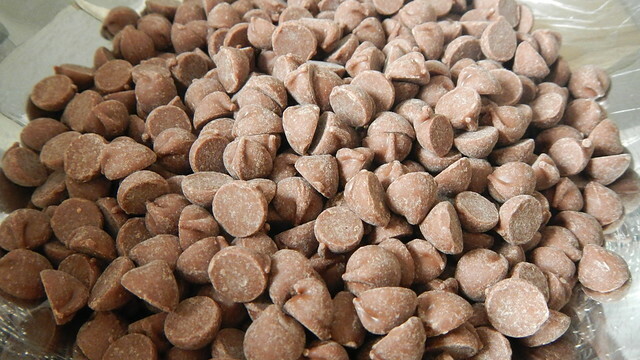 Then tip in 1/2 cup chocolate chips and 1 tablespoon espresso powder. 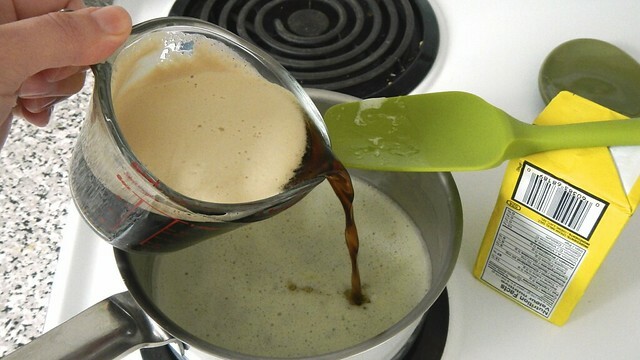 Once that’s mixed in, stop stirring and leave the whole thing to boil (but not burn!) for 8 minutes. 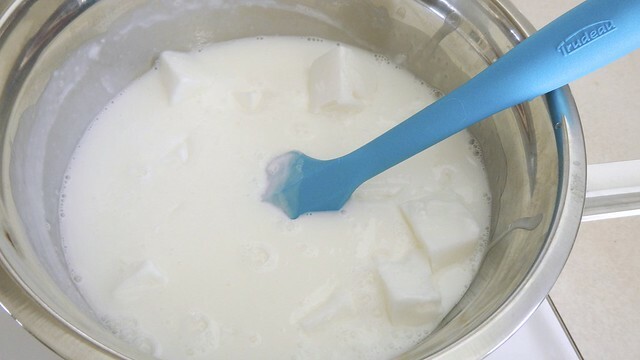 Remove the pan from the heat and stir in 1 tablespoon vanilla. Remember, it’s gonna fizz. 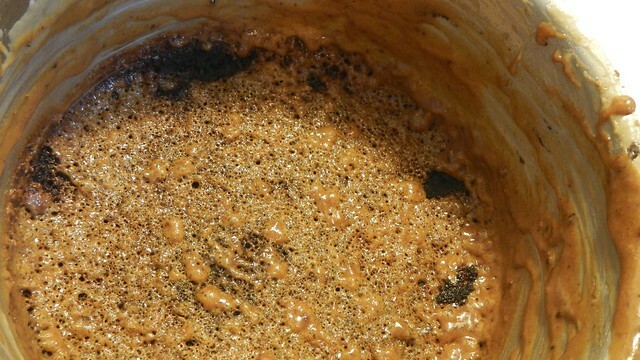 Let the mixture cool for 10 minutes; then grab an electric mixer and beat the crap out of it for about 5 minutes, until it looks and feels like almost-melted peanut butter. 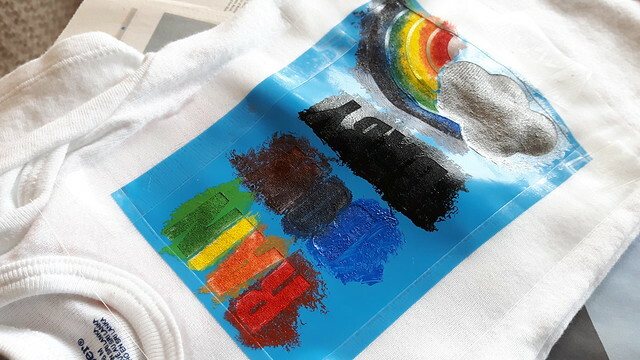 Spill that into the prepared pan and smooth it down. Shove it in the fridge for 4 hours, until it’s all firm. 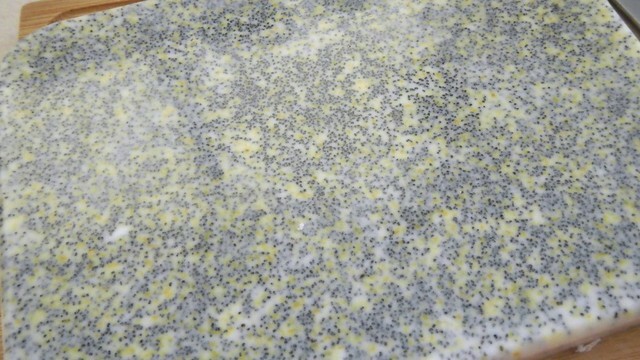 Run a knife around the outside edge and use the parchment to pull the whole thing out of the pan. 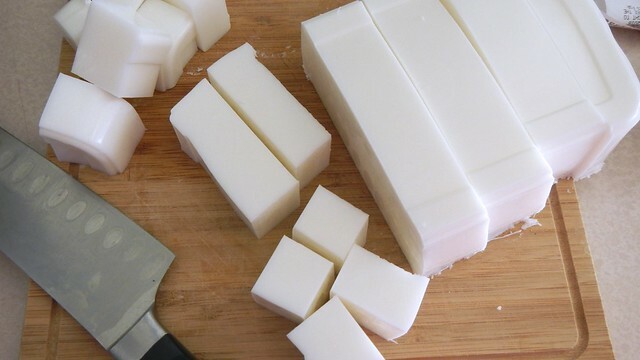 Cut it into cubes. I just spent the weekend hanging around in Chel’s living room, eating her food and lolling about on her couch. 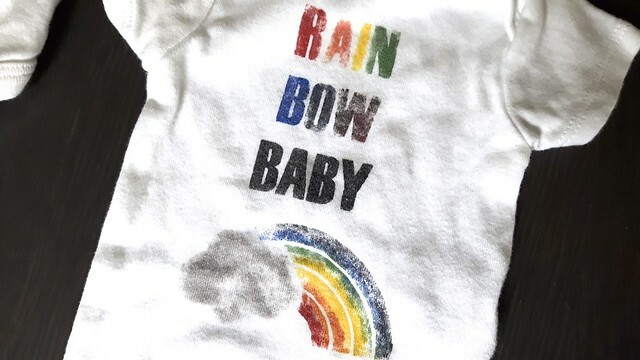 So before I did that, I whipped up a cute little beauty of a wee giftie for her and I’m quite pleased with how it turned out. 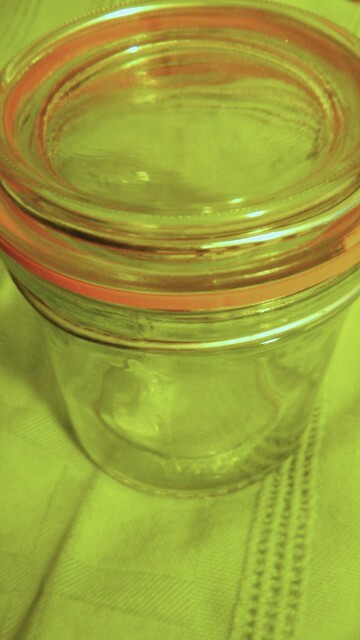 Start with a clean (and cute) jar. 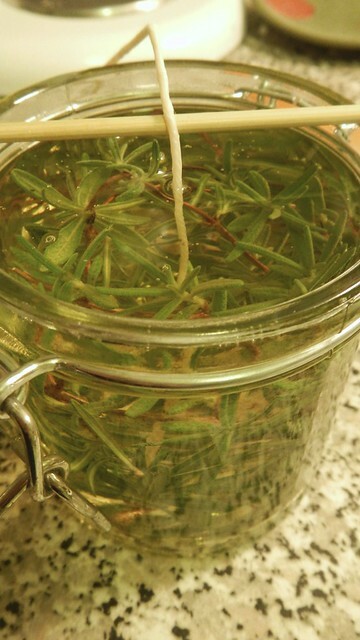 Glue a nice long candle wick to the bottom of it and stuff fresh woody herbs like rosemary around the sides. Grab a decent amount of soy wax, enough to fit your jar, and melt that sucker up. Add some essential oils. 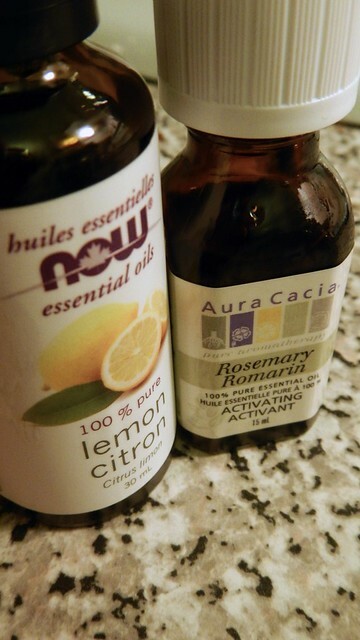 I added lemon along with the rosemary oil because it works well with rosemary and I love it. 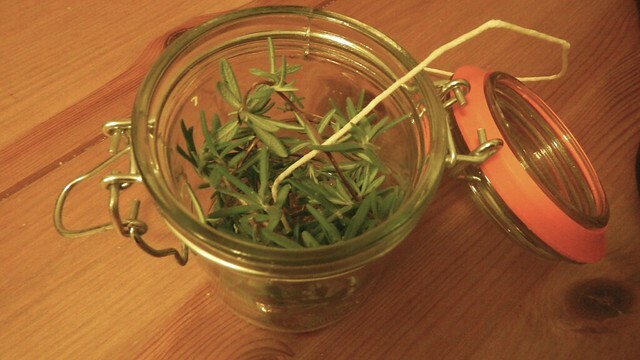 Pour your wax into your jar and poke the herbs down so they don’t float. 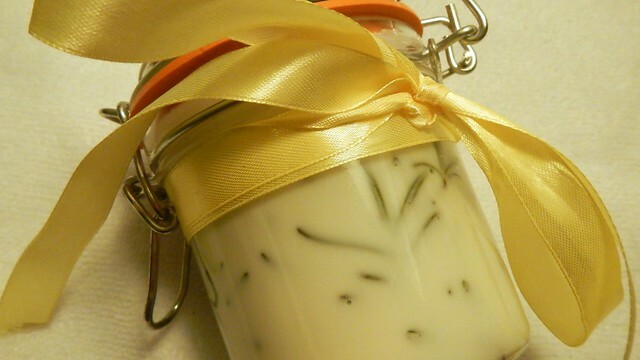 Let solidify and garnish with a pretty ribbon. 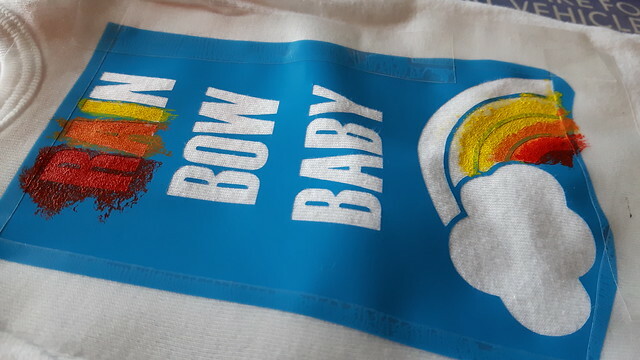 Gift away! You may remember that last year I surreptitiously liberated several service or Saskatoon berries from city property. This year it rained on Canada Day, our national holiday, and between thunderstorms I went out and hauled in about 4 litres of them. 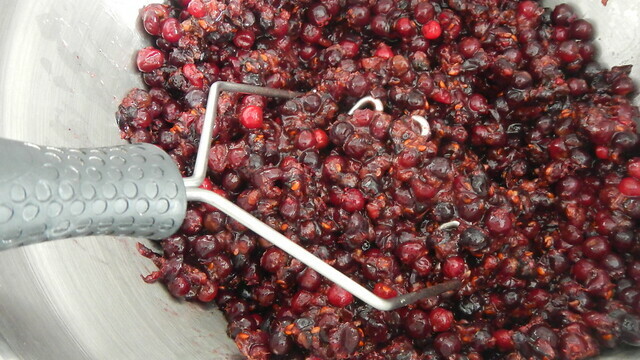 Everyone who passed through the kitchen during our Canada Day get-together asked where I’d gotten so many cranberries. I got a little testy explaining that they were service berries each time. I guess they DO kind of look like cranberries, but whatever. I decided to make jam out of all my berries (and I actually ended up with so many berries that I had some leftover even after two batches of jam). 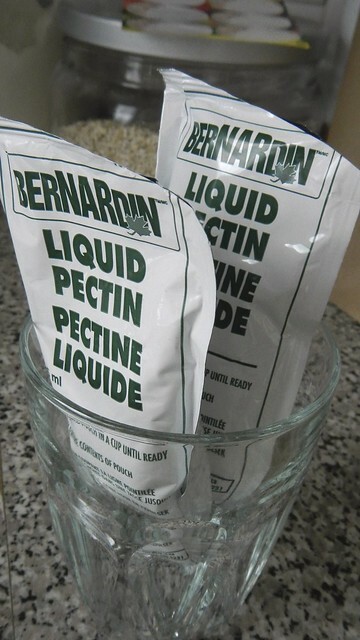 I bought two dozen of the wee 175mL Bernardin canning jars and popped them into my canner to sterilize. I turned on the stove and brought those to a low boil. I put the rings aside and put the discs in a heatproof bowl. 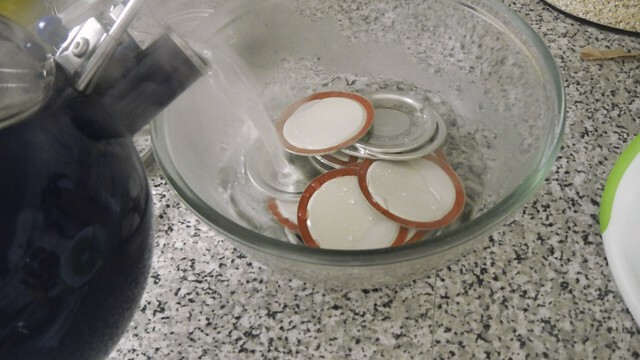 I heated a kettle and poured almost boiling water over the discs to let the rubber soften. I gathered my other canning tools and had them handy. 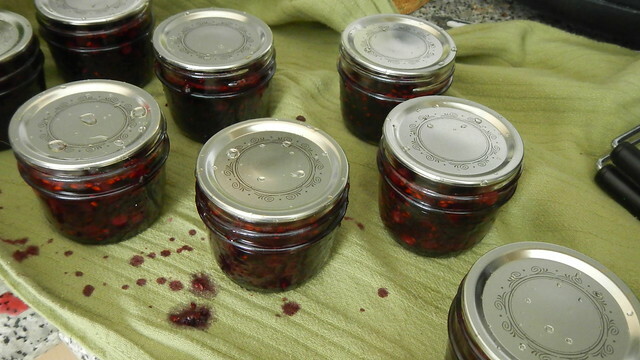 Always use non-metallic implements when making jam. I get very irritated when I make jam because I always end up either burning myself on boiling sugar or burning myself with steam or hot water and everything ends up sticky and it’s already hot making jam in the summer so I decided to double my batch so I wouldn’t have to repeat the process in the same day. When you do this you have to make sure that your proportions are exact so you don’t mess up your ratios of acid to sugar to pectin. 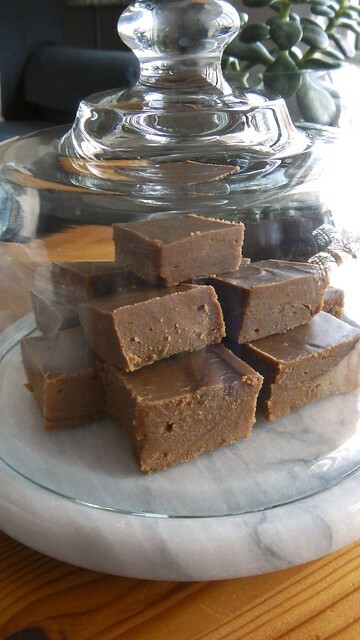 The recipe I used is from the Bernardin website and advocates the use of the crystallized pectin, but the liquid stuff had been on sale so I used that instead. 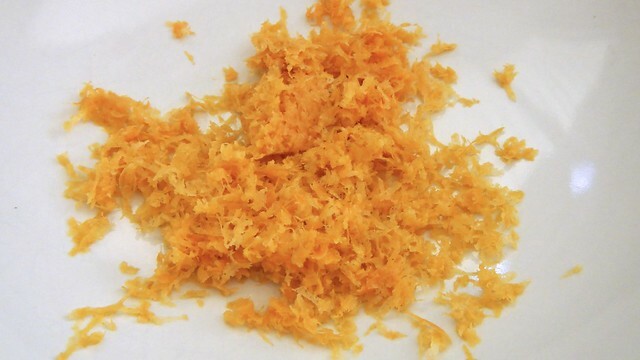 The process is a little different using liquid pectin in terms of when you add the sugar and stuff so the process below reflects that. 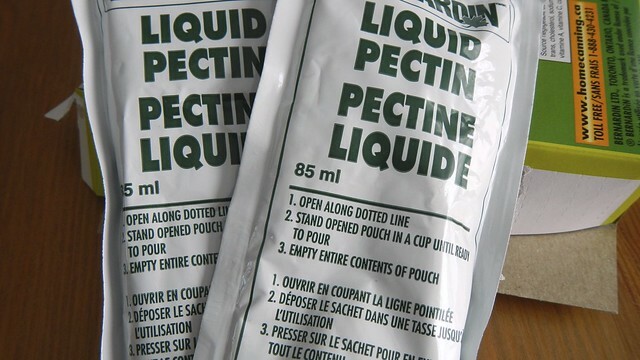 It’s a good idea to pre-cut the packages and sit them upright in a cup so they’re handy when you need them. 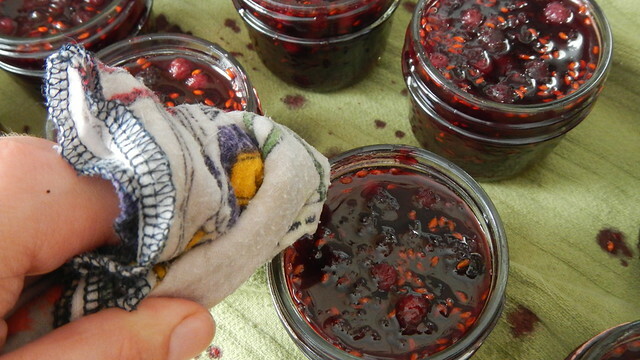 Now that all your canning stuff is ready to go, you can get onto the actual jam component. Grab your berries, about 9 cups service berries (for a single batch, though in these photos that’s doubled), and plop them in a pan. 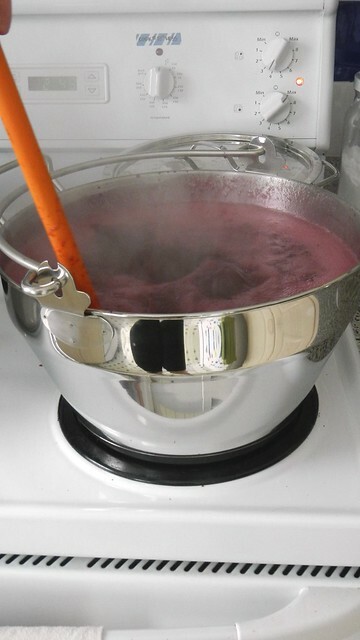 I like to use my Lee Valley maslin pan because it’s kind of designed for jam and candy making and I love it. 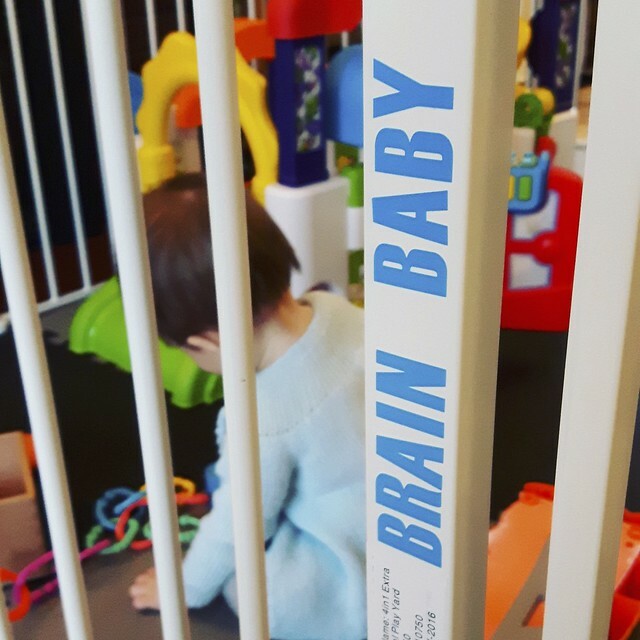 Plus it has a great handle that is very useful. 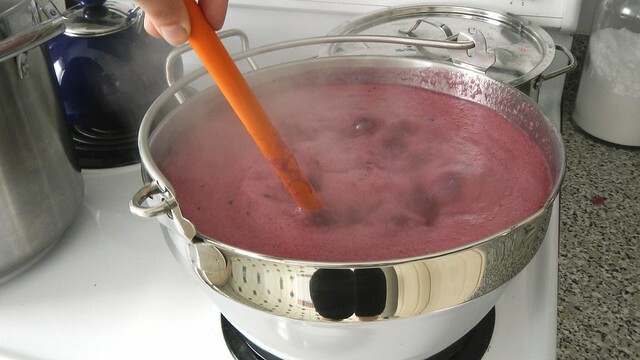 Mush up your berries with a potato masher so they don’t explode on you later and so all the berry goodness gets out there early on. Tip in as well 4 tablespoons lemon juice and 1/2 teaspoon butter or margarine (apparently this helps prevent it from foaming too much but I don’t think it helped in my case). 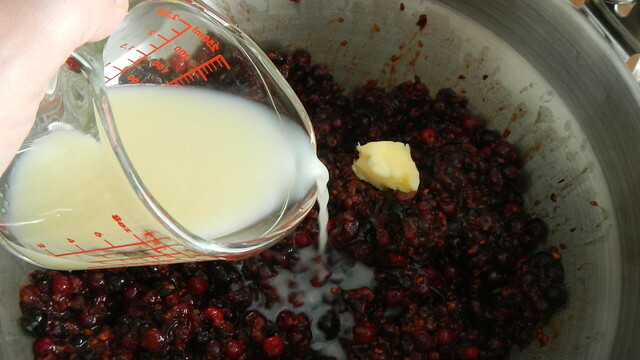 Start heating the berries on medium-high and give them a good stirring. 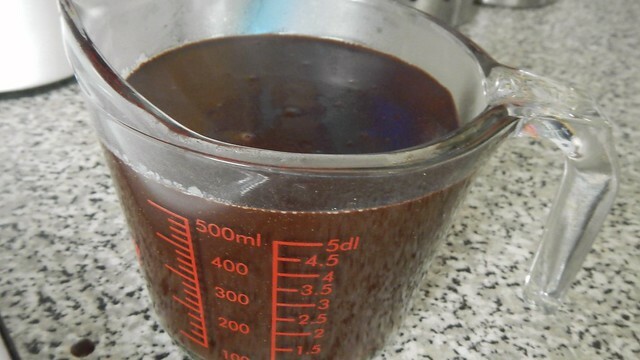 Measure out 6 cups granulated sugar and add that in as well. 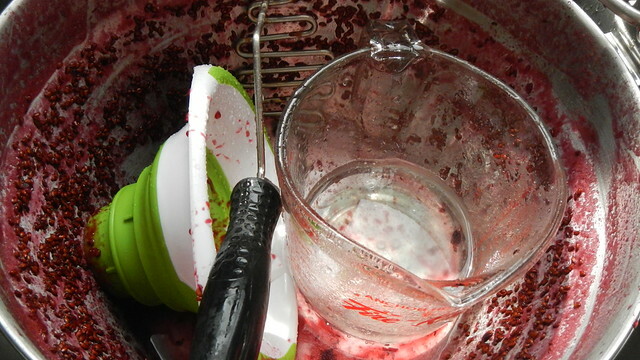 You’ll find the berries very quickly become way more liquidy. 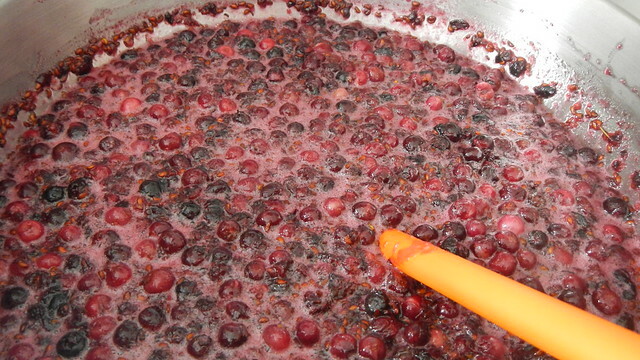 You want the berries to be at a decent boil that doesn’t go away when you stir (watch out for flying berry juice that can burn you). 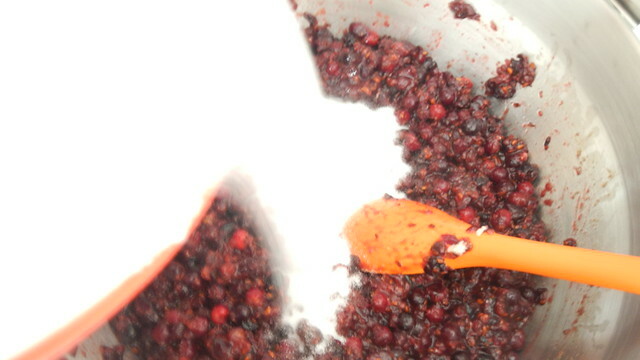 When you get to that state, grab your pectin and quickly add it to the jam and give it a quick but thorough stirring. 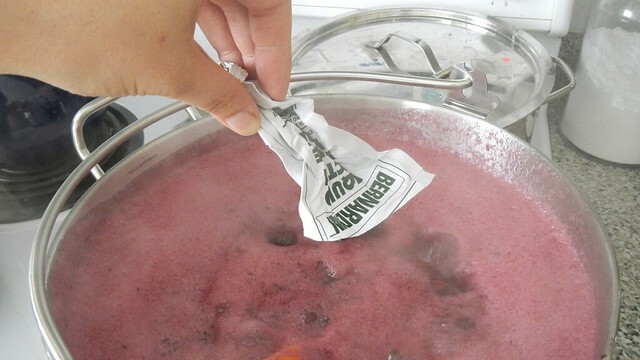 Let it come back to a rolling boil again and leave that for 1 minute before removing the jam from the heat. Don’t burn yourself! 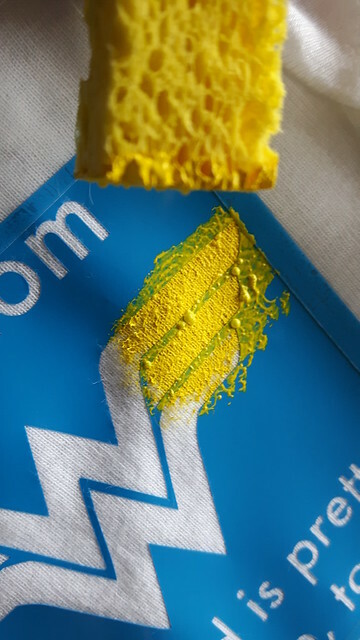 Skim off any foam with a non-metallic utensil. The jam foam was always a huge treat for us as kids to eat with a spoon. I offered it to the Pie and he refused it. 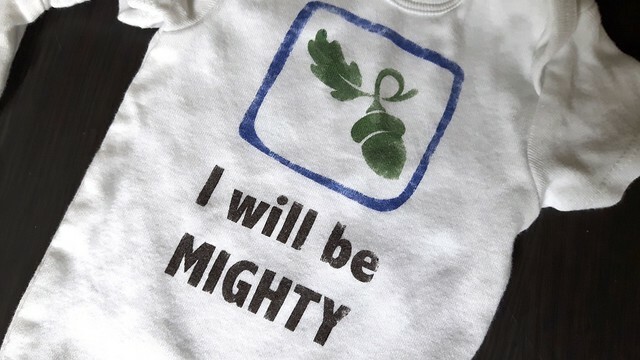 I was miffed about that. 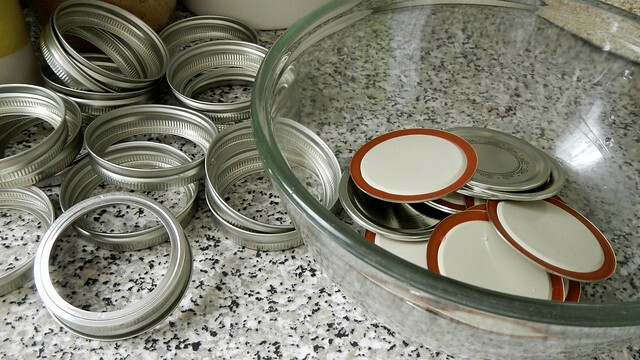 Grab your jars from the canner and drain them. 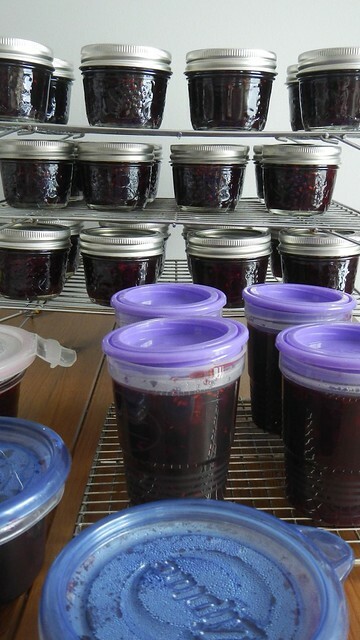 Fill them with your jam, leaving about 1/4″ of headspace between the jam and where the lid will go. 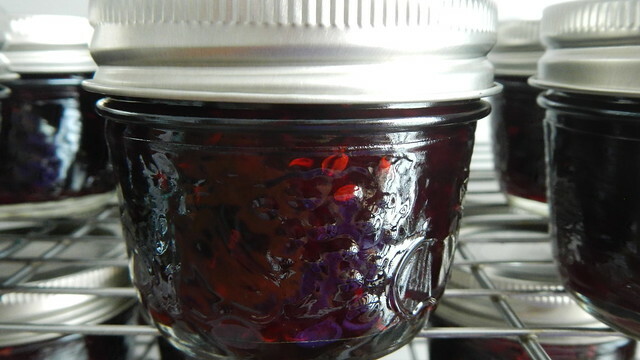 Use a wet towel to wipe off any jam on the edge of the jar where the disc will need to be tightly sealed. 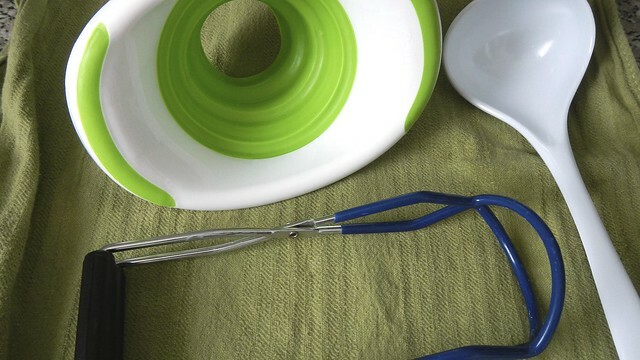 Plop the disks onto the jam jars and add the rings and tighten to fingertip tightness. 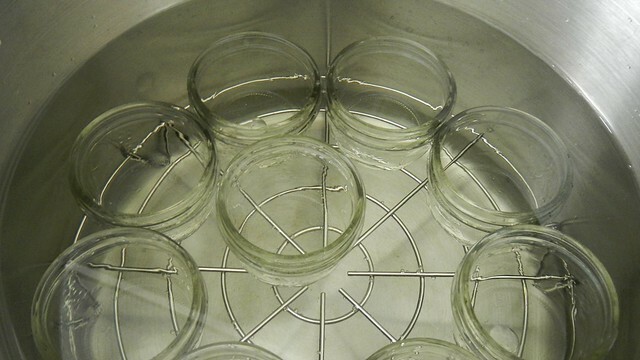 Return the sealed jars to your canner and bring the water back to a boil and leave it for the time required by your canner and the number of jars you have in there. 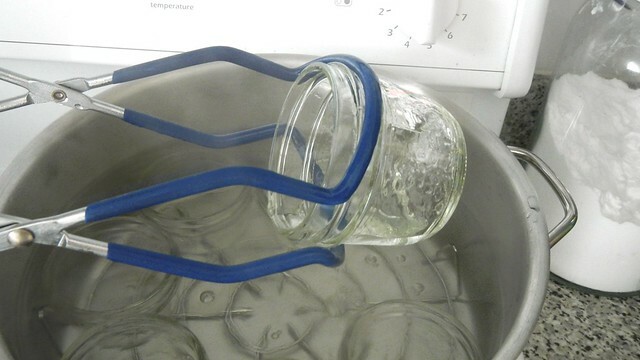 I set my jars on a cookie rack to cool completely. 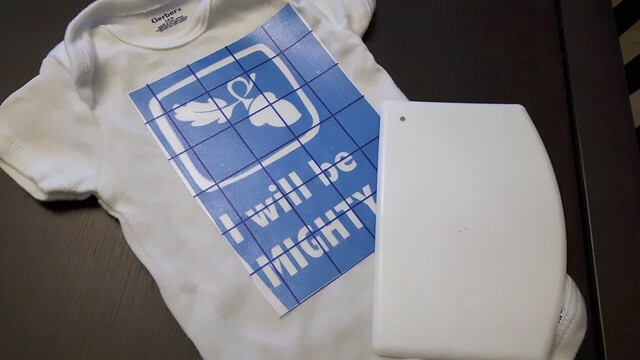 These are the first batch of my DIY holiday gifts this year. 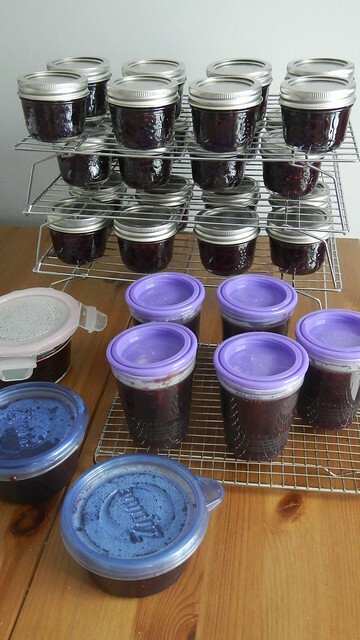 And I bought some overflow jars for myself, knowing I didn’t have enough jars for the jam I made. And I quickly filled the overflow jars, and then a bunch of plastic containers I had lying around. SO MUCH JAM. 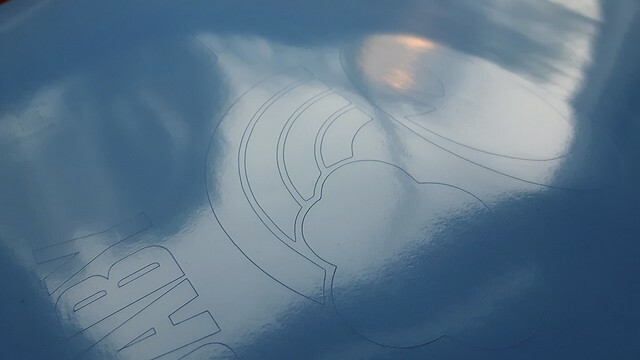 As you may have figured out by now, my birthday gifts to my friends and family members usually end up being the birthday cake of their choice – no cake too elaborate, no tower of layers too high. We have had a few memorable ones over the years, but this one sticks out because when I asked Atlas which cake she’d like for her birthday a couple weeks ago, she said she wanted a strawberry shortcake. 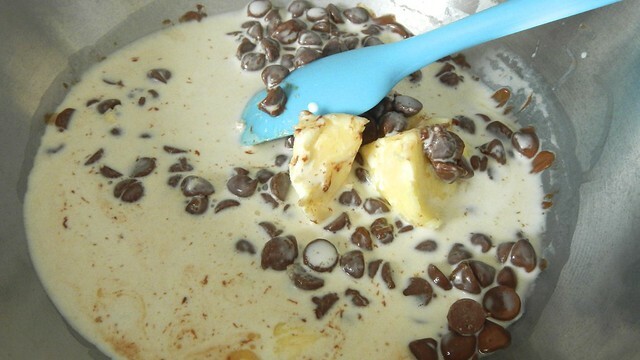 And I realized that I had never actually ever made this classical and simple dessert delight. 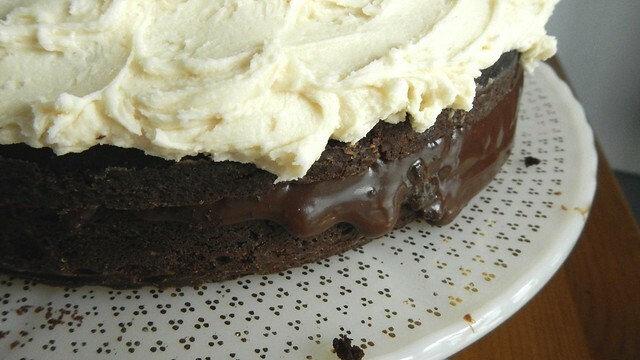 So I decided to go right back to the cake’s roots and make it as classic as possible, following this recipe from Fine Cooking. 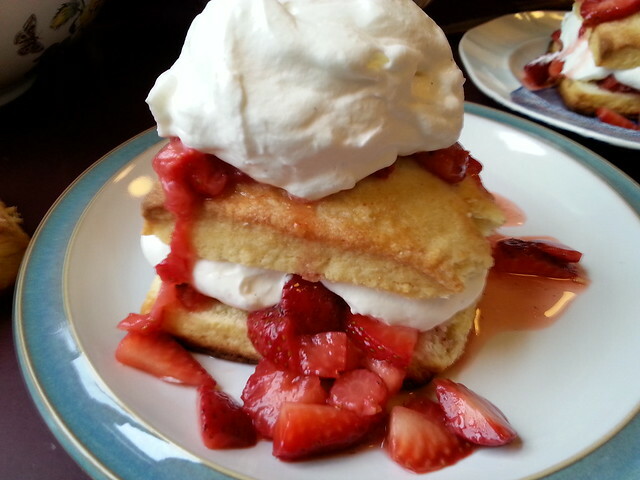 Strawberry shortcake, in its traditional form, is not really a cake at all. 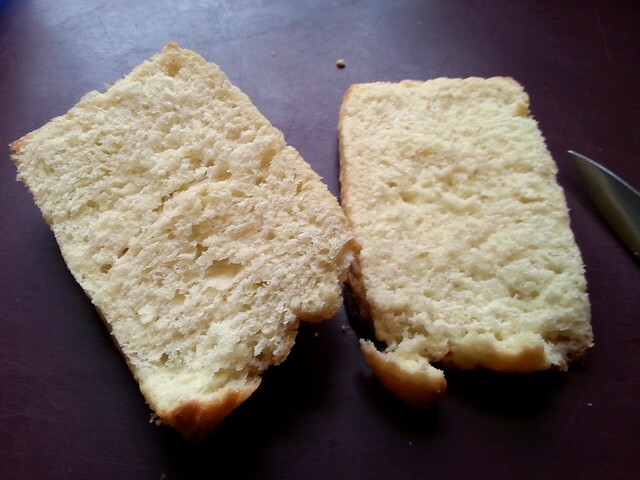 It’s more of a sweet sandwich in a biscuit (“short” cake indicating that the cake isn’t really made with any leavening agents and ends up pretty dense and flat). 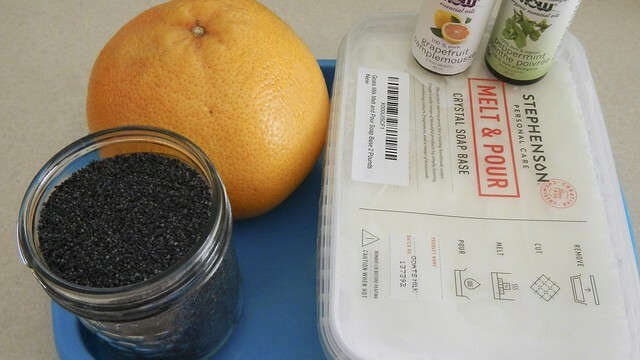 This recipe also doesn’t really lend itself well to making ahead, as it must be assembled immediately before cooking, but it’s simple enough that this is not a huge deal. 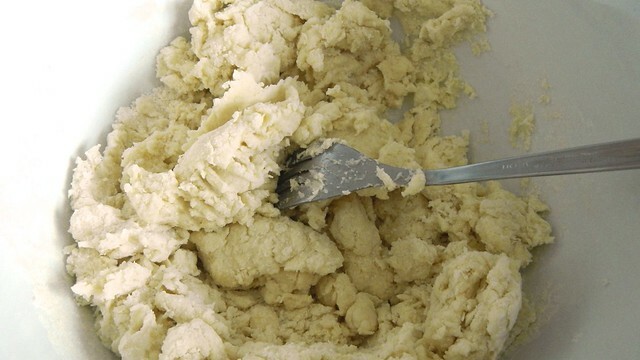 Let’s start with our dough, shall we? 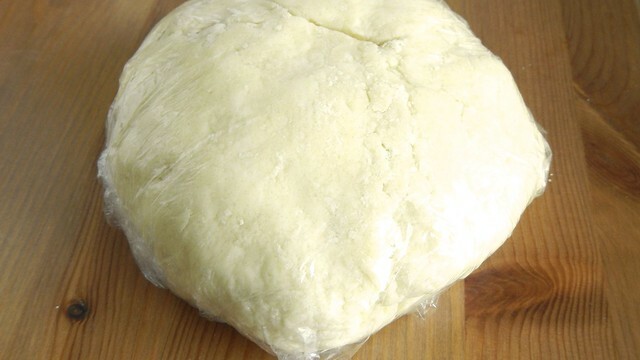 I did make the dough ahead of time, and kept it in the fridge, wrapped in plastic, until I was ready to bake it. 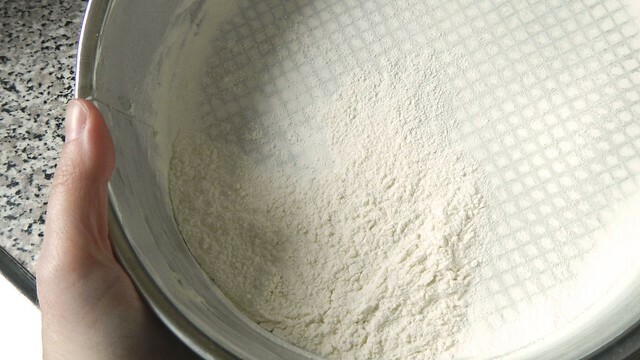 Grab 2 cups unbleached all-purpose flour, 1/3 cup plus 1 tablespoon granulated sugar, 2 1/2 teaspoons baking powder, and 1/4 teaspoon baking soda (leavening agents, I know, but give me a break). 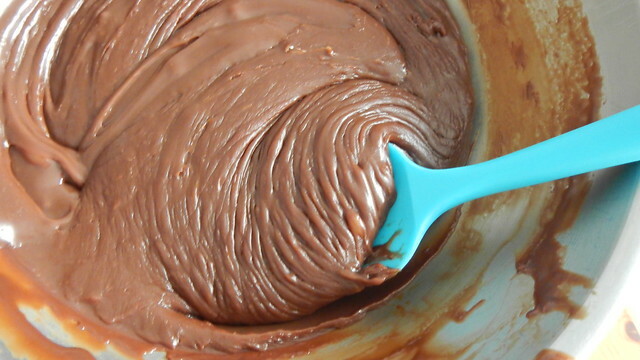 Whisk those around in a bowl until they’re nice and mixed. 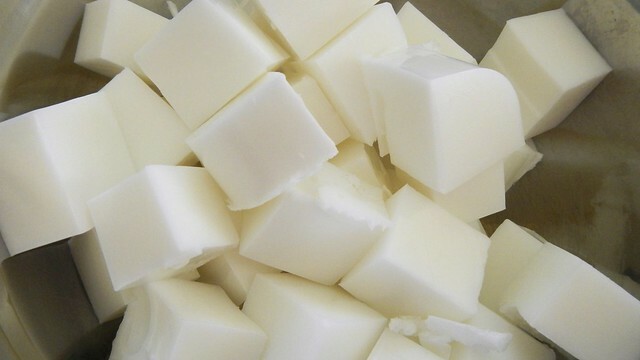 Now grab yourself 1/2 cup cold butter and cut it into little cubes. 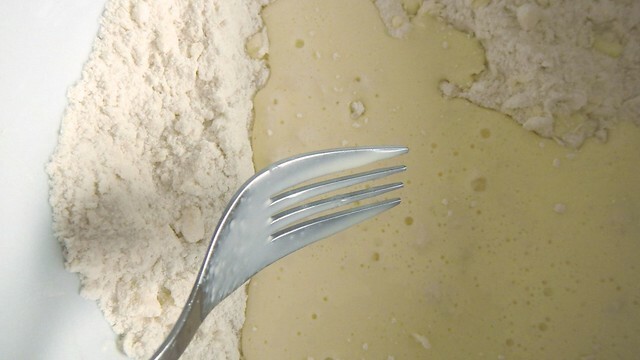 Tip the butter into the flour and use a pastry cutter to blend it all up until you have a mess of coarse-looking flour with pea-sized bits of butter throughout. 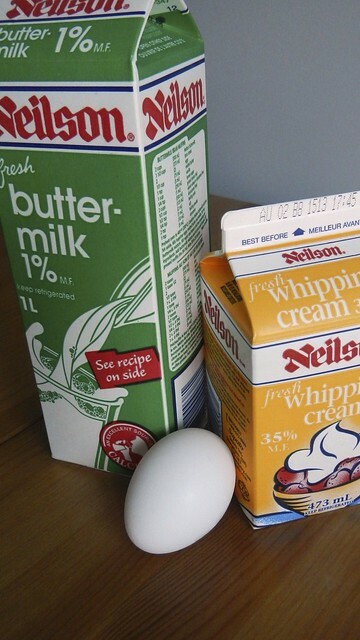 In another bowl, mix together 1/4 cup whipping cream, 1/4 cup buttermilk (why oh why don’t they sell buttermilk in smaller cartons? ), and 1 large egg. 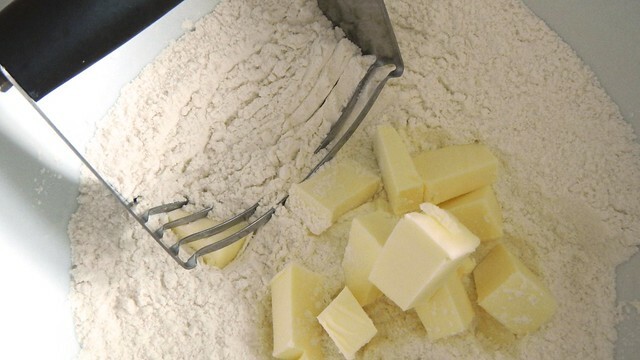 Make a well in the centre of your flour/butter mixture and pour in the wet ingredients. 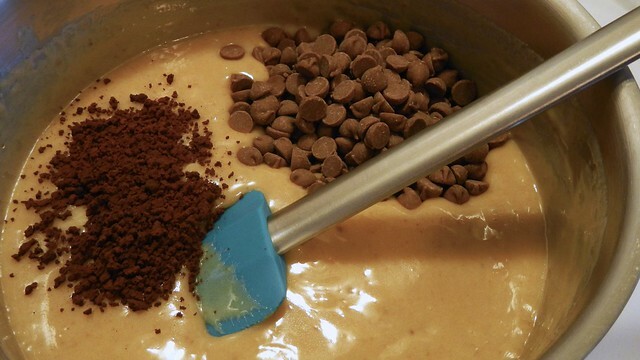 Stir that around with a fork until you get a shaggy dough. 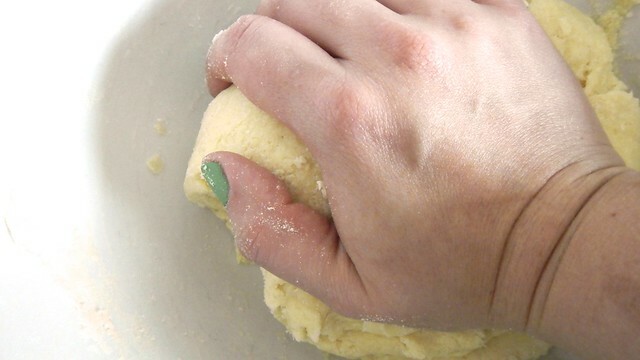 Then knead it a little bit with your hand until it all comes together. At this point I wrapped it tight in plastic wrap and shoved it in the fridge overnight, but if you want to bake it right away you totally can. 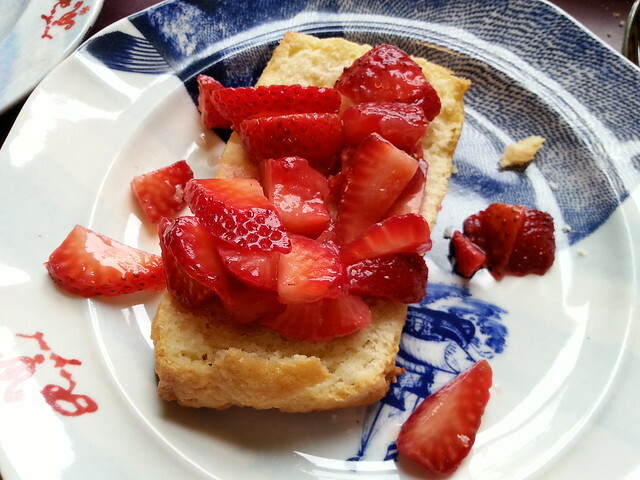 Ideally the biscuits are made so that they’re still slightly warm when you assemble them with the strawberries, but you can make them up to four hours ahead of when you need them. Just make sure to col them completely and then shove them in an airtight container until they’re needed. 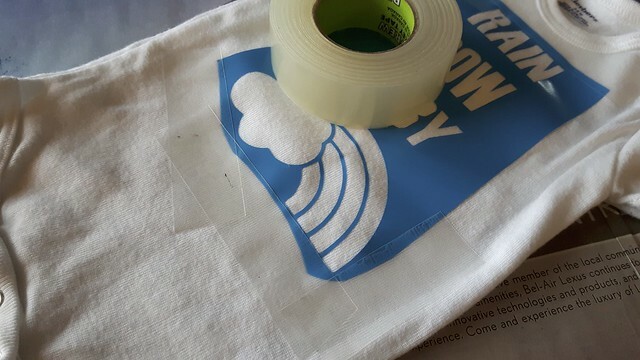 So when you’re ready to bake, preheat your oven to 425°F, line a baking sheet with parchment paper, and lightly flour a nice surface to work on. 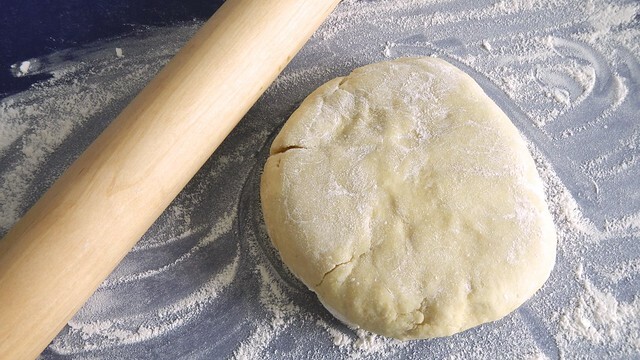 Grab your rolling pin as well. 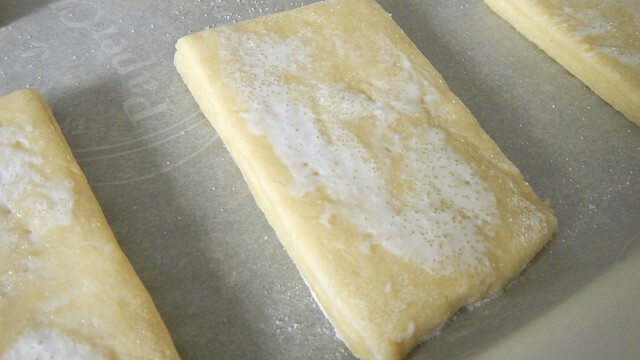 Roll the dough out into a rough rectangle about 3/4″ thick. 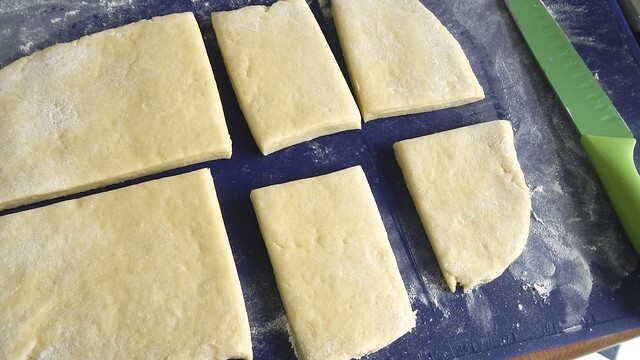 The original recipe calls for making six biscuits from this dough but those seemed absolutely ginormous so I cut the rectangle into eight biscuits instead and even then they were pretty big. 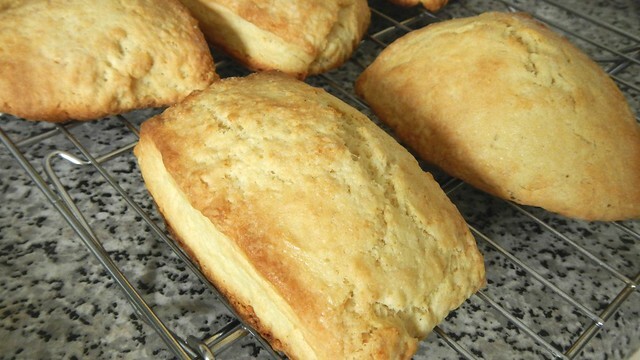 Lay the cut biscuits on your baking sheet and brush with a tablespoon of whipping cream and sprinkle with a bit more sugar. 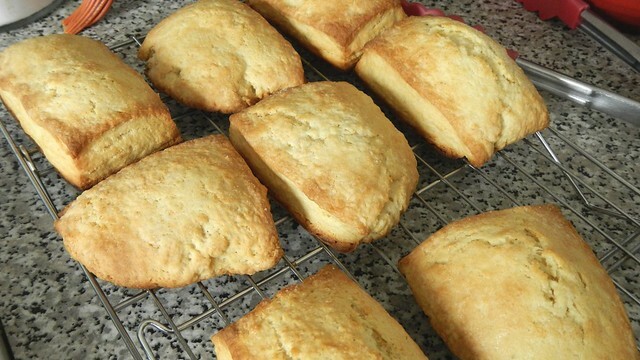 Bake those for 10-15 minutes, until golden brown. 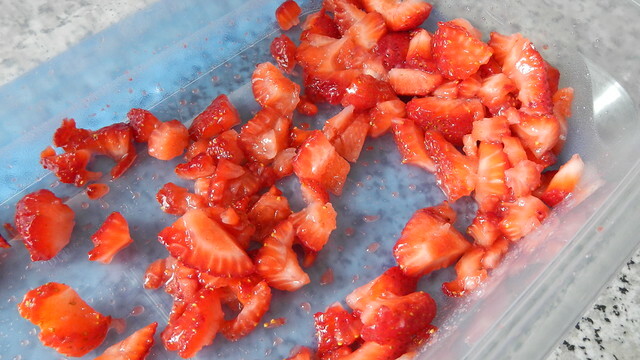 While they’re baking and cooling slightly, you can do your strawberries. 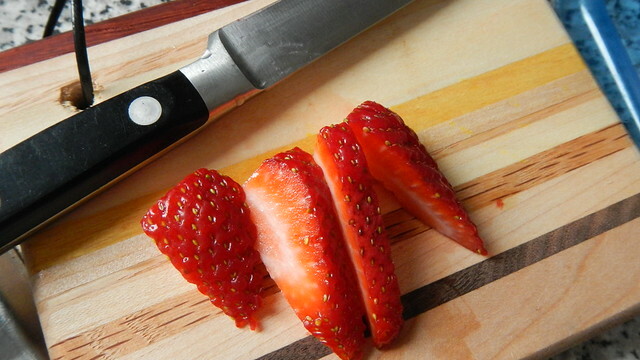 You can prepare the strawberries a couple hours ahead of time as well, because they need to macerate (i.e. 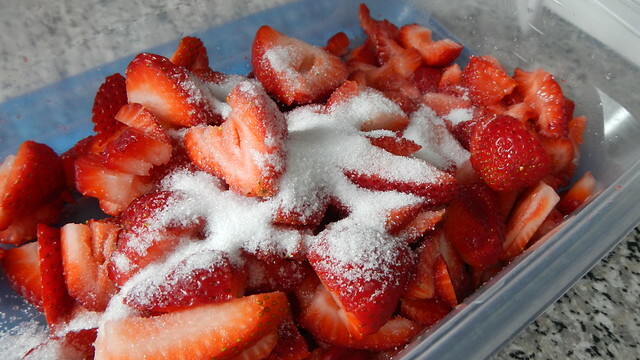 sit cut up in sugar) for at least 30 minutes. 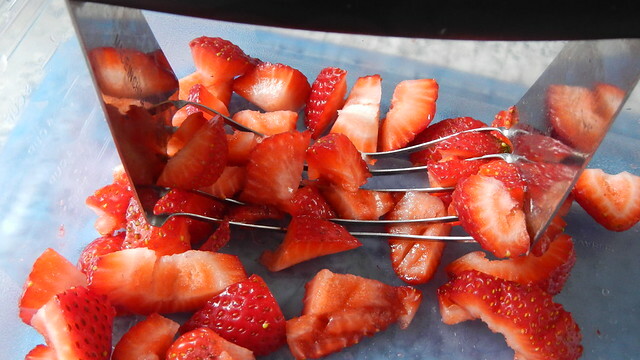 The recipe calls for 1lb fresh strawberries, but I probably used about 1 1/2lbs, and we all agreed later that I could have used the whole 2lbs that I bought. 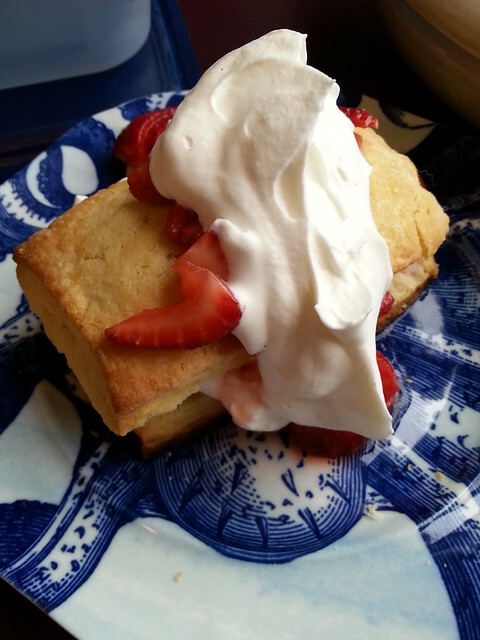 You can never have too many strawberries in strawberry shortcake. 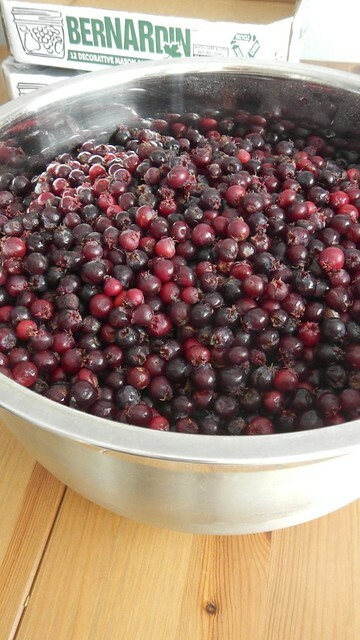 Anyway, wash and hull the berries, and then take about one third of them and use a potato masher or pastry cutter to mush them up in the bottom of a bowl. 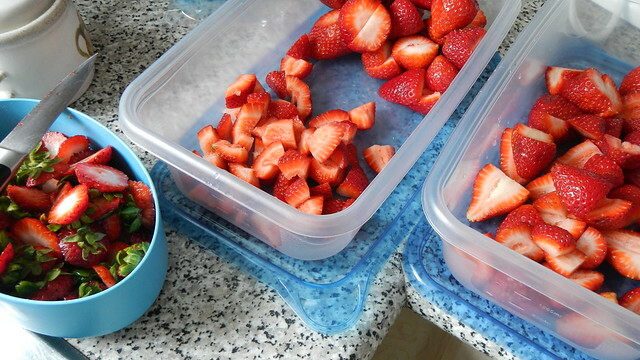 Slice the rest of the berries and plop them in the bowl with the strawberry mush. Tip in 2 tablespoons granulated sugar and give that a stir. 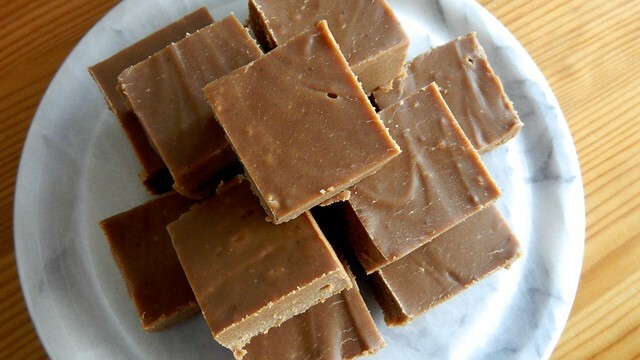 Leave that to sit at room temperature for at least 30 minutes. 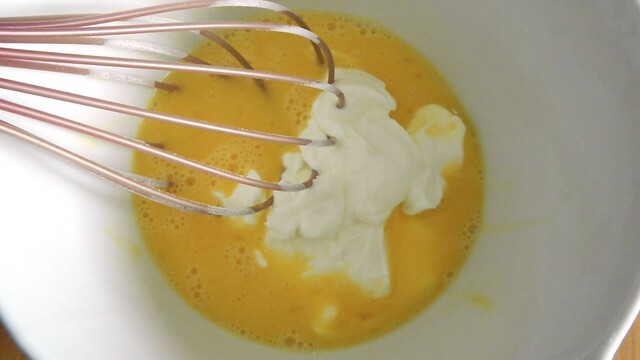 At this time you might as well also chuck a bowl for whipping cream into the freezer, along with whatever beater you are going to use. Cold utensils make for a better whipped cream. 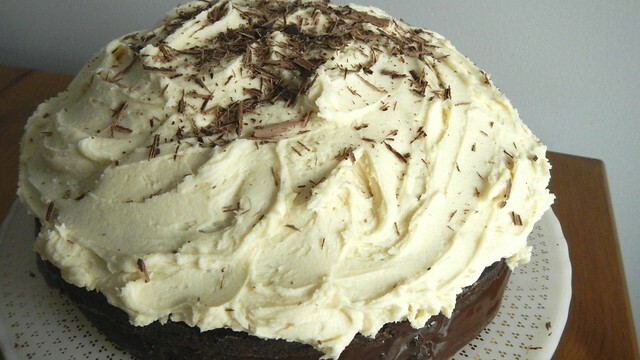 Now you’ve finished your lunch or dinner and it’s time to assemble the cakes. 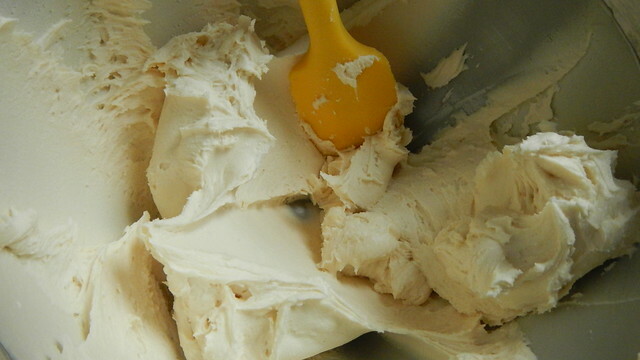 Grab your bowl and beaters out of the freezer and pour in 1 1/2 cups whipping cream. Add vanilla and sugar to taste. 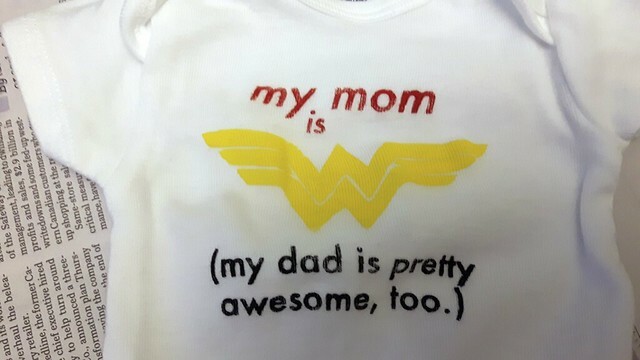 I don’t have any photos of this because the Pie did it while I was doing other things. Use a serrated knife to cut all the biscuits in half horizontally and set the bottoms of the biscuits on your serving plates. 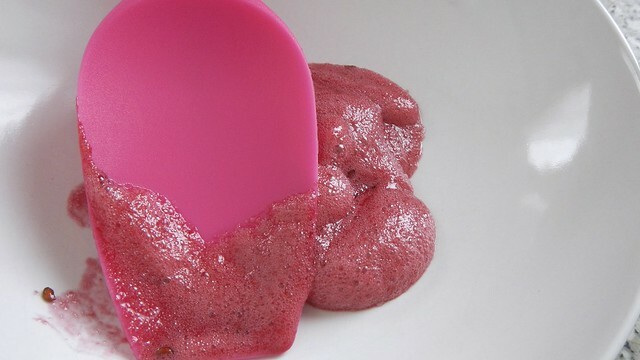 Spoon on a generous amount of strawberry goo. 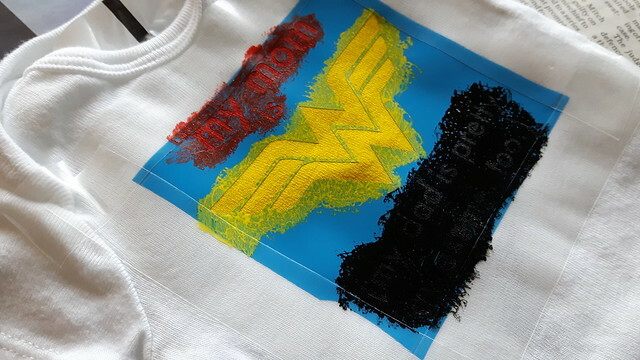 It’s okay if it spills off the edges – it looks all artistic that way. 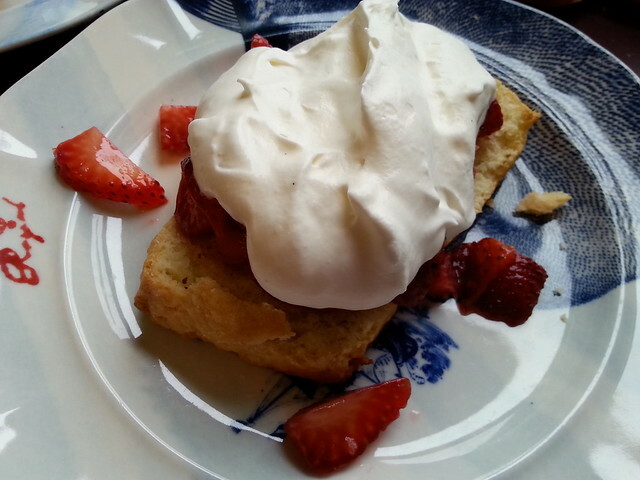 Add a generous dollop of whipped cream to the mix. 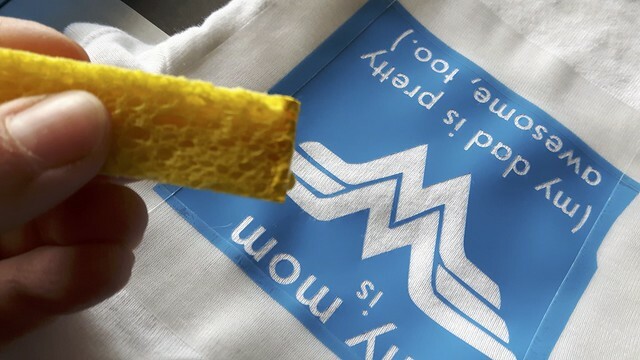 Then plop the biscuit top on. 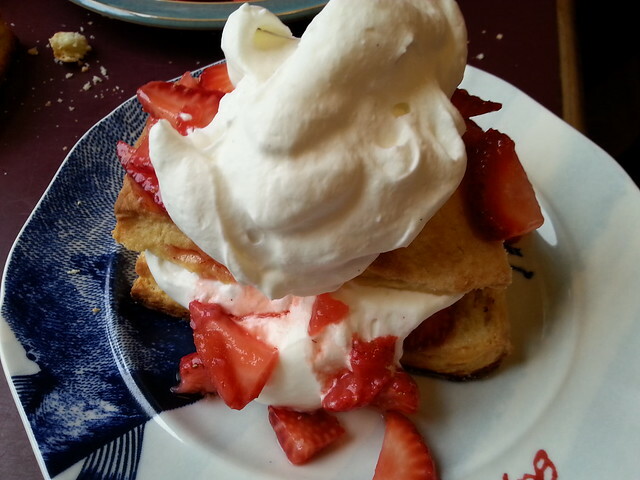 Add another scoop of strawberry goo, followed by more whipped cream. It was Krystopf’s birthday last weekend, and, as I do for the fam-dambly, I take on the cake-making duties as a present – the birthday person gets to pick whatever one they want and I do my best. Krystopf picked a Guinness Chocolate Cake, which is a very grown-up sort of cake (he did turn 38 after all, so I *suppose* he’s a grown-up). 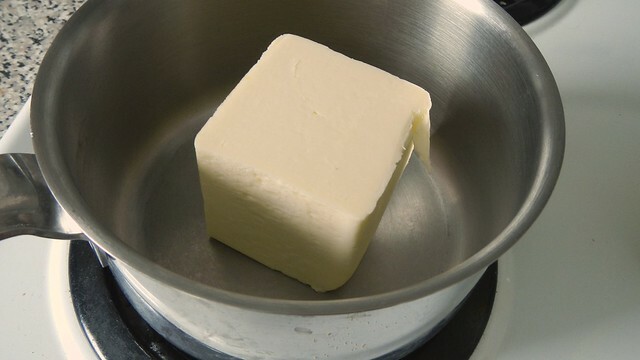 In a saucepan over medium heat, melt 1 cup butter. 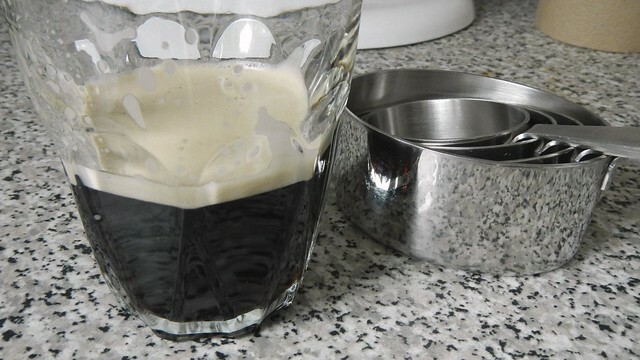 Pour 1 cup Guinness (or other stout if you prefer). Keep the rest for yourself. 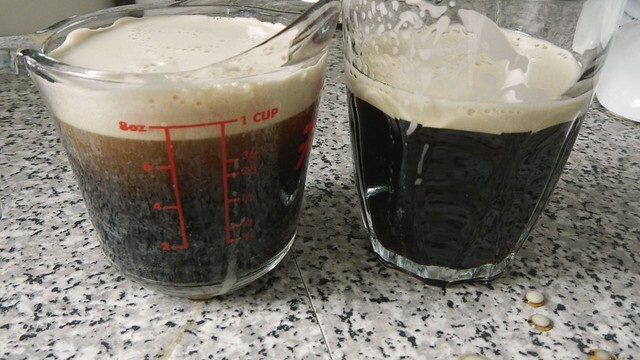 It’s never too early for drinking Guinness, especially if you’re baking. 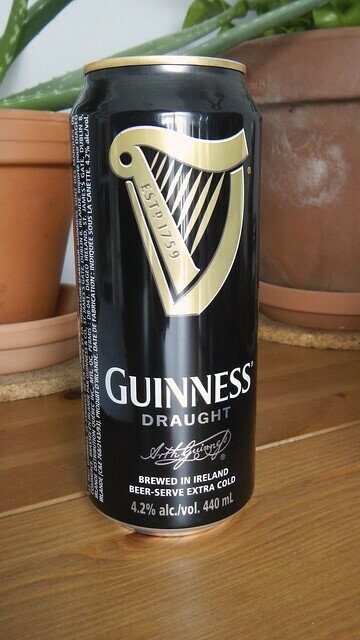 Pour the Guinness into the butter and stir it up. 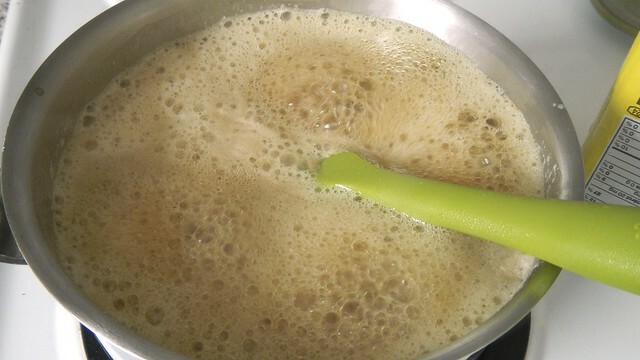 Allow that to come to a foamy simmer before removing it from the heat. 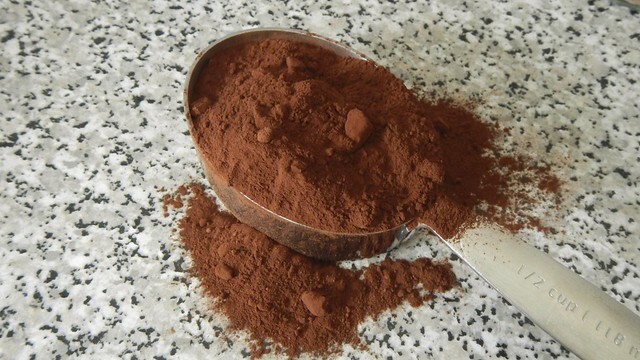 Whisk in 3/4 cup unsweetened cocoa powder. Let that cool for a little bit. 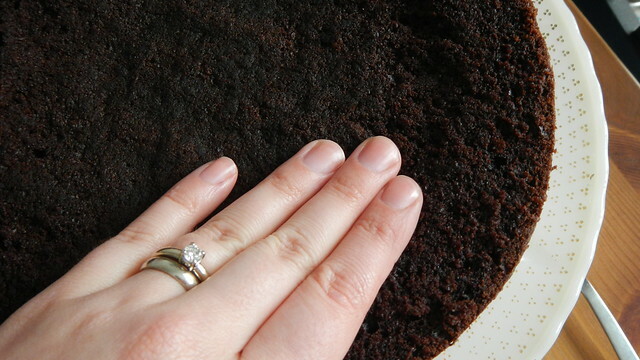 In the meantime, preheat your oven to 350°F and butter and flour a 9″ cake pan. This one is springform because I find with fancy cakes it just makes everything easier. 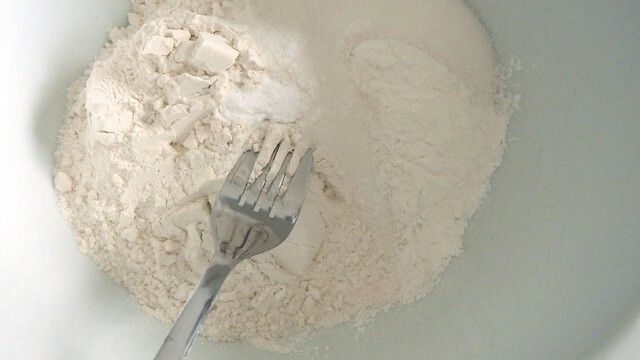 Now, in a large bowl, whisk together 2 cups flour, 1 1/2 teaspoons baking soda, and 1 cup sugar. In a smaller bowl, beat up 2 large eggs and tip in 2/3 cup sour cream. 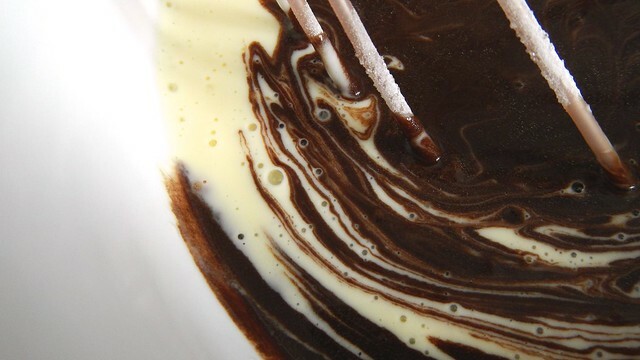 Pour your no-longer-hot chocolate Guinness butter mix into the egg and sour cream mix and stir it up. 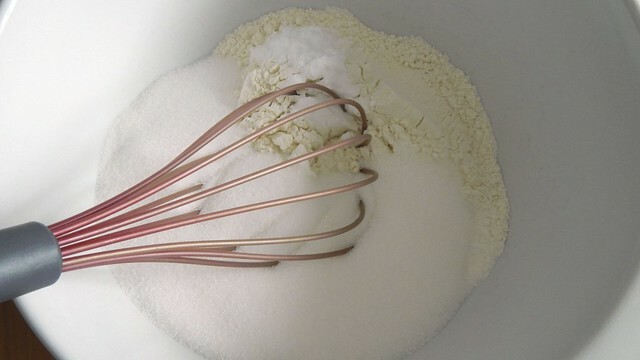 My whisk has a much heavier handle than the whisk part and I always have to remember to take it out of the bowl when I let go of it. This ONE TIME, I forgot. That is chocolate all over my floor. 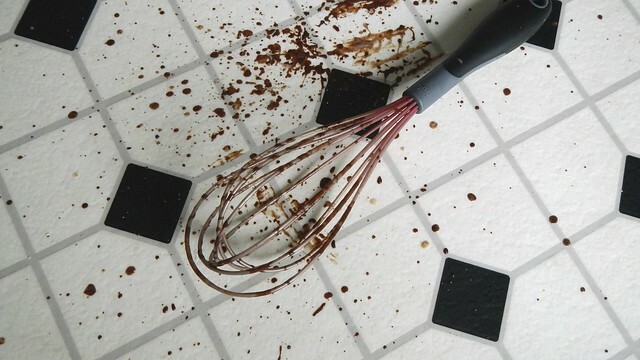 Time for a new whisk. 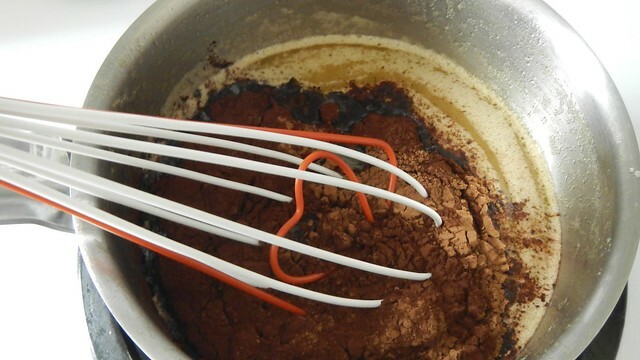 Now pour your chocolate goo into your flour and whisk until fully combined and smooth. 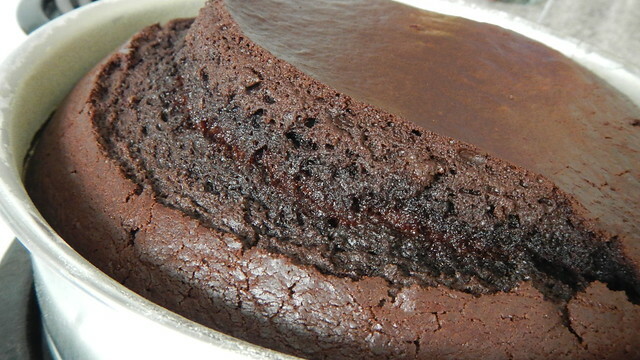 Pour that in your cake pan and shove it in the oven. The recipe Atlas gave me said it would take 35-40 minutes, but I found it took closer to 60 minutes to cook all the way through. 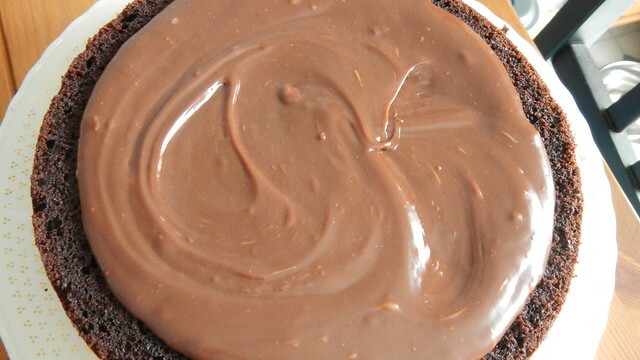 While that’s on the go, you can make your filling. 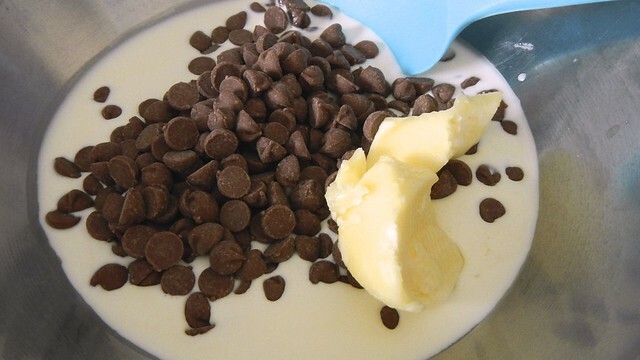 Slam 8oz bittersweet chocolate chips into a heatproof bowl and top with 2/3 cup heavy (whipping) cream and 2 tablespoons butter. 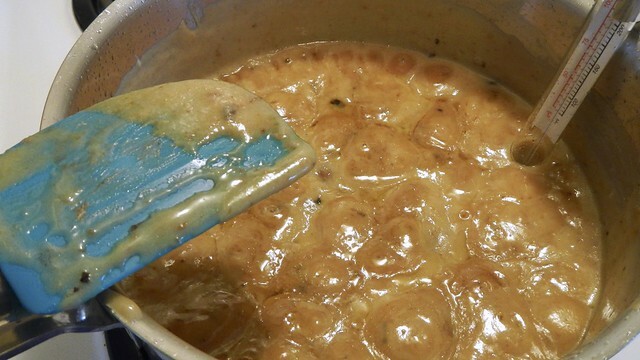 Plop that over a pot of simmering water and melt, melt, melt! 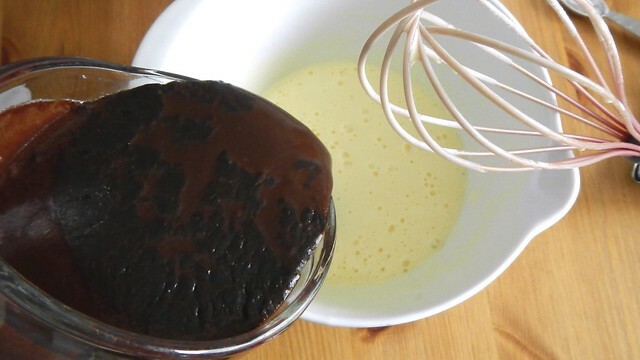 Set the finished ganâche aside to cool until it’s the consistency of pudding. 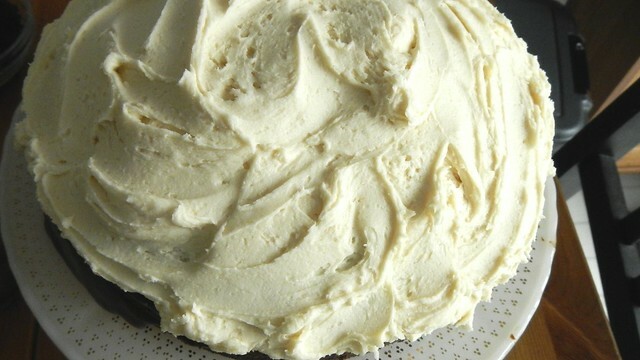 Now you can work on the frosting. 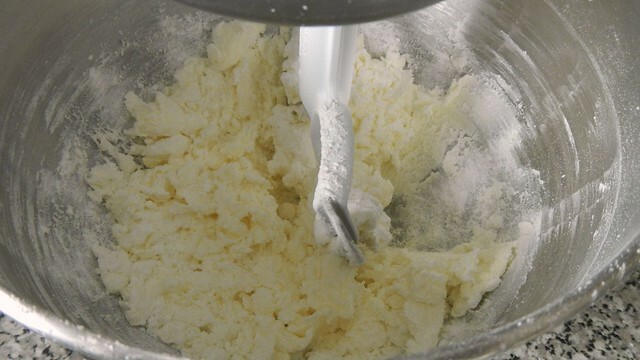 In the bowl of an electric mixer, dump 1/2 cup room temperature butter and whip that until it’s pale and creamy. Slowly beat in 3-4 cups icing sugar. 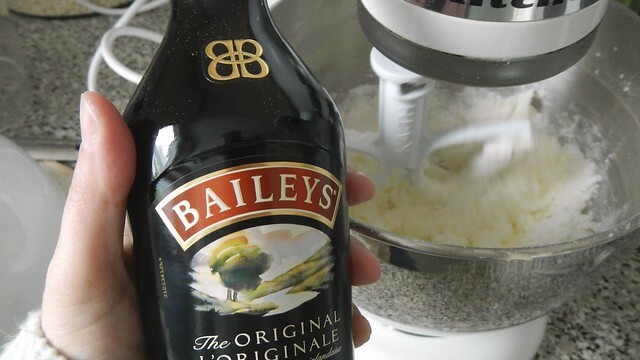 If it gets too stiff, add in 3-4 tablespoons Bailey’s or other Irish cream liqueur. 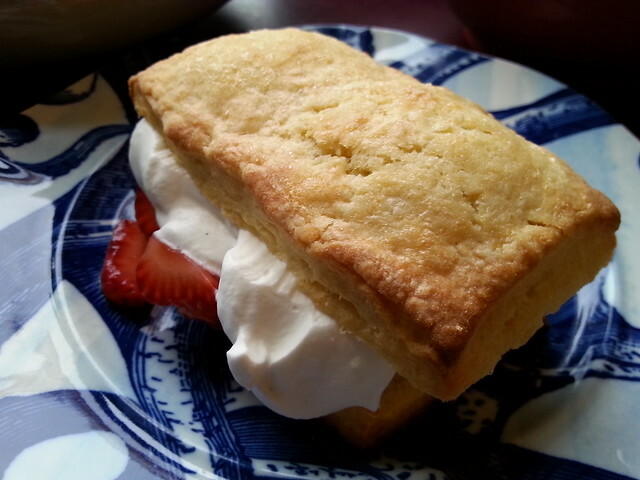 I also found a little dribble of whipping cream got it to that perfectly creamy, spreadable consistency. 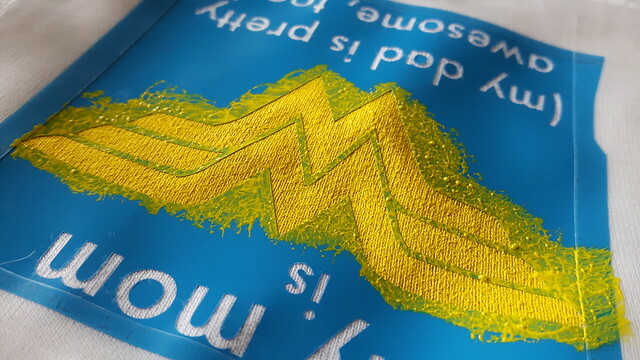 By this time hopefully your cake is gorgeously baked and entirely cool. 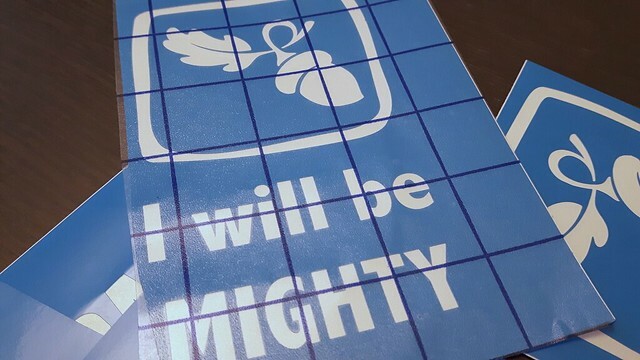 If not, then you’ll just have to wait a bit longer. 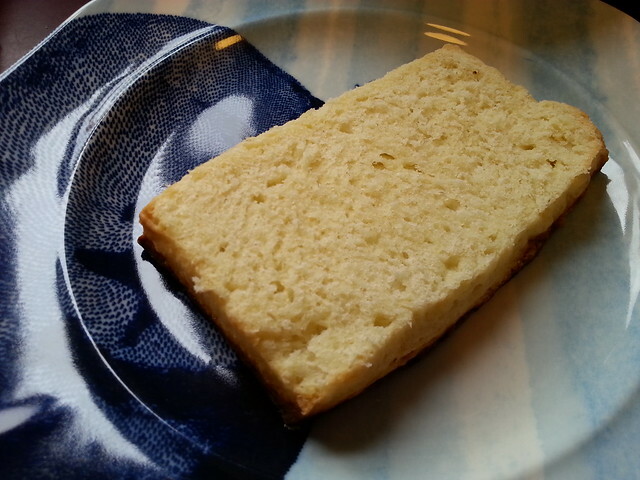 When it’s ready, slice the cake in half horizontally. 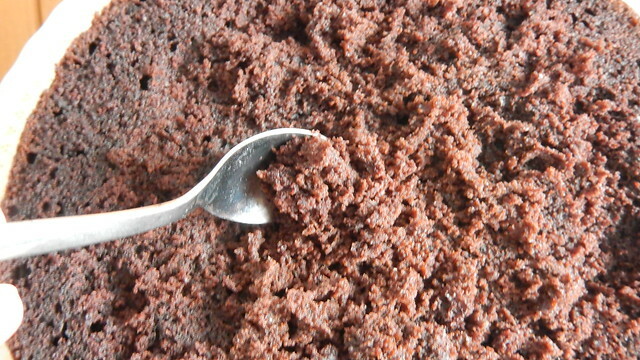 Take a small spoon to the bottom half and scrape away a bit of the inside. 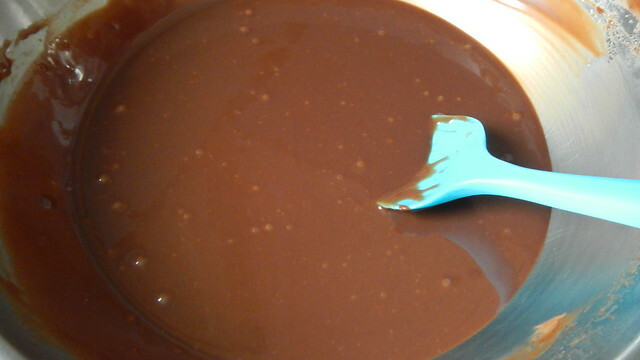 Use your fingers to press down, creating a shallow bowl. 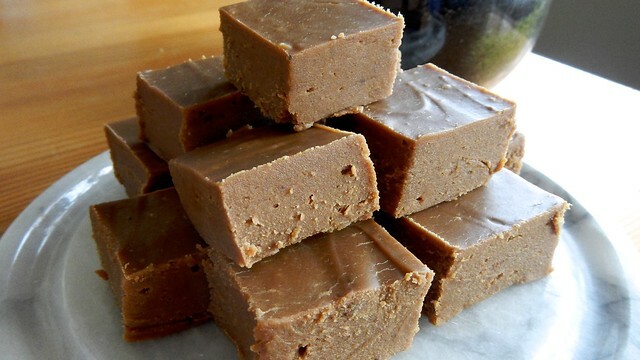 By now your ganâche should look like this. 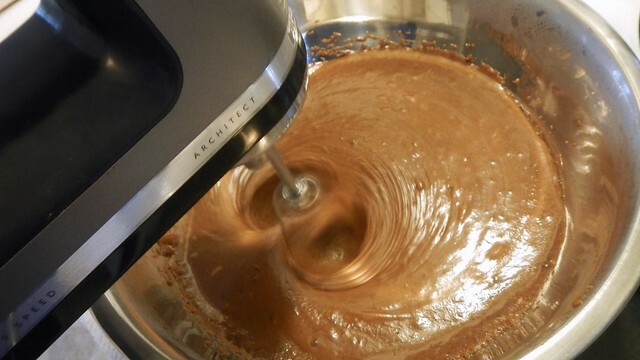 Pour that gorgeousness into the little bowl in your cake. 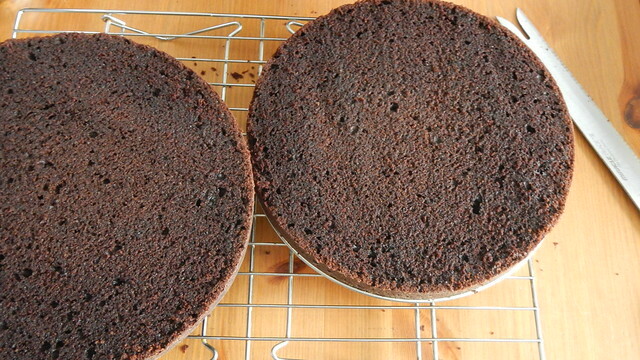 I didn’t use all the ganâche here because otherwise I was afraid it would run over the sides when I put the top on. 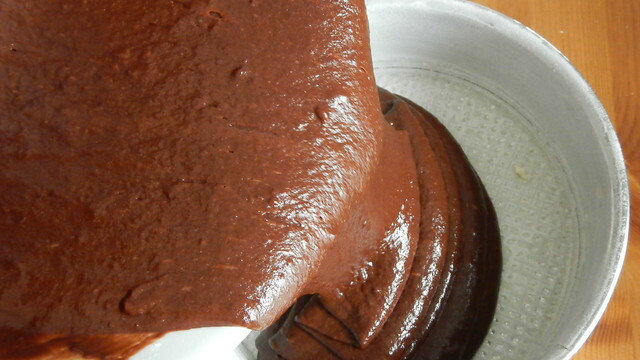 And it did that anyway, so in future I would use all the ganâche and purposely make it run down the sides. Put the top on the cake. 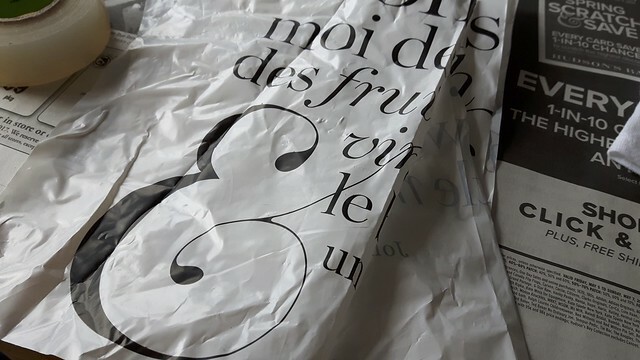 You can see that the ganâche is already peeking out. 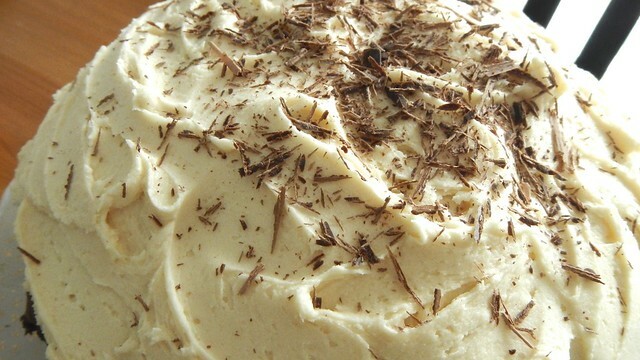 Spread your icing thickly on top. 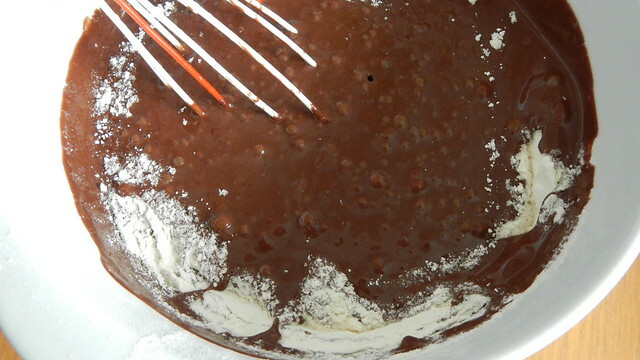 It’s already pushing the ganâche out the sides so I decided to forego icing the sides altogether and just do the top. Then it kind of looks like a poured Guinness with a nice frothy head. 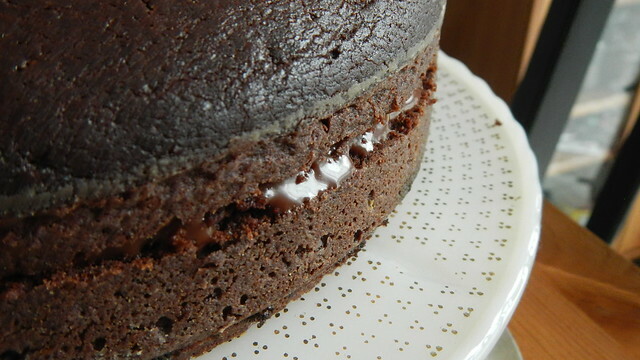 The final touch was shaving a bit of bittersweet chocolate on top. Serve to your brother or your friends and family. They’ll all enjoy it!